There are so many awesome things to do in Quito! Home to Ecuador’s largest international airport, Quito is frequently used as a gateway city to access the rest of Ecuador. 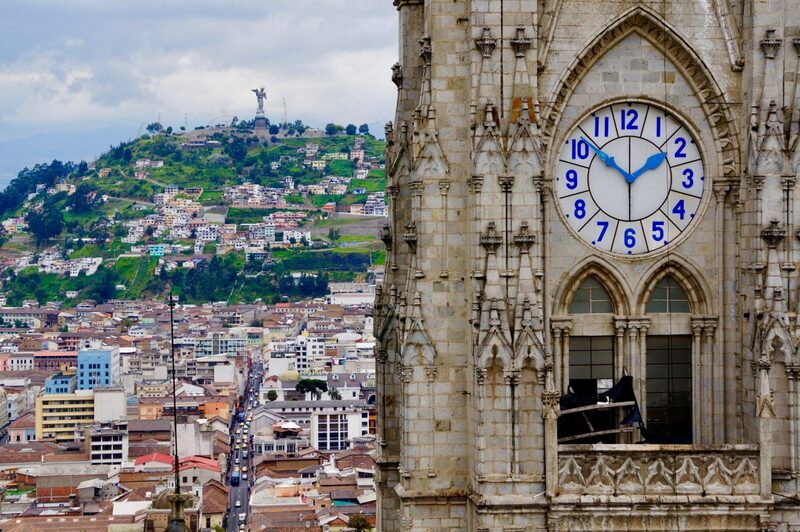 Often travelers visit Quito as a quick one-day stopover on the way to the Galapagos. But there are so many fun things to do in Quito, that a longer stay can be easily justified. The many things to do listed within this detailed Quito travel guide show all the best attractions and activities to pursue while in Ecuador’s high-altitude capital city. Bonus: Plan Your Trip to Quito Ecuador! Quito is the capital of Ecuador and the country’s second largest city. At an elevation of 2,850 meters (9,350 feet, or nearly 2 miles high), Quito is also the highest constitutional capital city in the entire world. 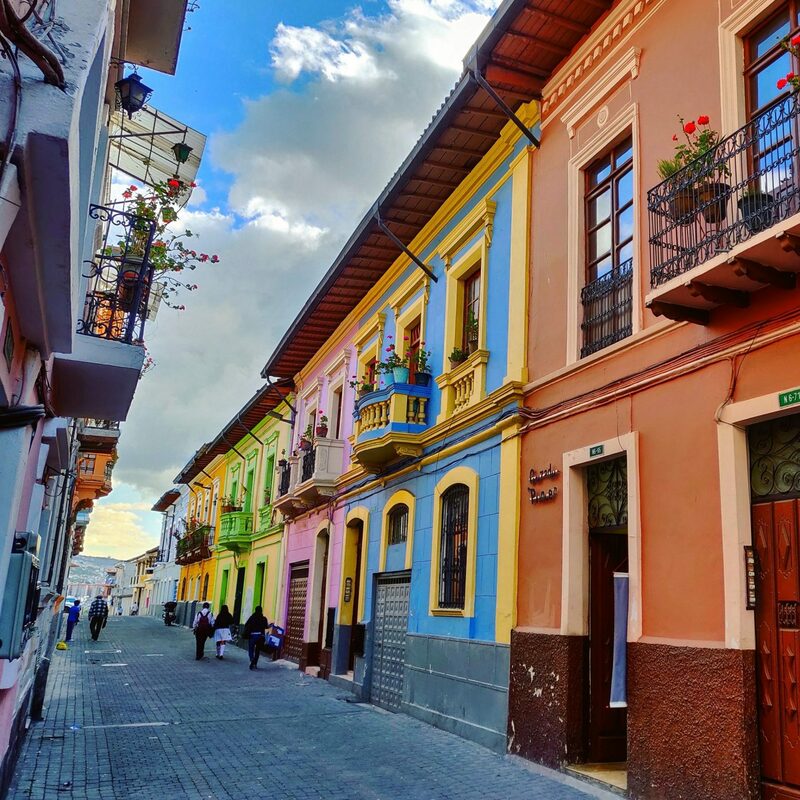 This high-flung city dates way back to its founding of 1534 and some of the architecture from that century can still be found in Quito’s Old Town today. But fast-forward to 2019 and visitors will realize that Quito is a fascinating mix of old-meets-new. Historic alleyways and baroque buildings are situated against a backdrop of modern skyscrapers with trendy eateries. Quito is a land of beautiful contrasts. Quito is indeed a busy and sprawling metropolis. Yet the looming volcanos and tranquil Andean mountain peaks surrounding the city provide a stark reminder of the serene landscapes all around. a ride into the Andes on one of our favorite cable cars in the world. Add to all that some fantastic local cuisine to eat plus some interesting local drinks to tip back and you’ll begin to comprehend that there really are so many things to do in Quito. Yet those who like adventure should budget extra time into their Ecuador itinerary for Quito’s day trips. Quito acts as an excellent travel hub to organize excursions and even overnight journeys to the many worthwhile destinations in the Andes that are less than a two-hour drive to reach. There’s an abundance of popular Quito day trips to consider, from summiting an icy volcano to river tubing through a lush cloud forest. We’ve now spent nearly two full months in Quito on two separate trips, thoroughly researching and scouting out all the best activities, to now assemble these vetted recommendations in this carefully culled list of recommendations. This Quito travel guide is not only full of activity suggestions. It goes further to pack in all the information, directions, and logistics to actually get pursue each Quito attraction. This is all in a grand effort to help travelers make the most of a visit to Quito by providing the detailed info needed to plan a trip here. We hope this Best Things To Do In Quito Travel Guide proves helpful to anyone considering traveling to this awesome city! 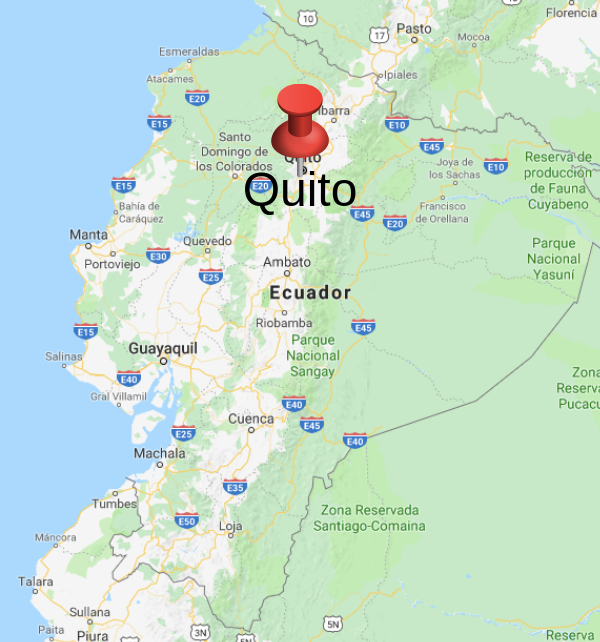 All of the things to do in Quito mentioned in this guide can be found on the map below to better understand exactly where everything is. It’s a Google Map too, so you can even use it on your phone to help find all the suggested things to do once you’re on the ground in Quito. Quito’s Old Town acts as a show-stealer within Ecuador’s capital city. Wandering through the bustling streets among centuries-old architecture is not just something to see it Quito. This is something to experience. Quito Old Town has the best-preserved, least altered historic center in all of Latin America. It’s this recognition that led Quito to become the first city in the world to be declared a UNESCO World Heritage Site (alongside Krakow, Poland) back in 1978. Read the full UNESCO description here. Quito Old Town delivers not only cultural significance, but also lots of charm. Despite earthquakes and modernization, the baroque buildings throughout Quito’s Old Town remain largely intact. It can feel like another era wandering amongst the beautiful architecture that’s been here for nearly a half millennium! Presidential Palace: also known as Carondelet Palace, this is where Ecuador’s president lives and works. Metropolitan Cathedral: Catholic church completed in 1565 and now the archdiocese. Has tour & museum ($3). La Compañía de Jesus: a 17th-century Jesuit church a few blocks away from Plaza Grande, known for its gold-covered interior. Plaza San Francisco: Quito plaza that contains the city’s oldest church (St Francis), street vendors, a chapel, museum with religious art, and cafes. But it’s the Andes views you can see here on a clear day that provide a beautiful natural backdrop against this wide & barren plaza. La Merced: White, domed Catholic Church (1736) that contains important artworks and library. San Agustin: Historical convent (1617), where Ecuador’s Independence Act was signed and houses many paintings from 17th-century artist Miguel de Santiago. Hourlong tours of the halls and interior courtyard are $2. City Museum: Learn all about the history of Quito through the chronological exhibits in this former hospital building. For those interested in architecture, churches, and history, it’s easily possible to spend an entire day or more exploring Quito Old Town. Yet even those with a casual interest should still be fascinated for hours strolling through Old Town’s cobblestone alleyways. Budget some time to take a break at one of the many cafes in order to simply watch life in Quito pass by. Or consider winding down a stroll through the historic center at 🍺 Bandido Brewing for what we say is the best craft beer in Quito Old Town. (It’s $3 pints during happy hour from 4:00-7:00). 🕒 Hours: Best to explore during daylight hours. Avoid late at night. 📍 Location: Plaza Grande is located here. Take an Uber or taxi. From La Mariscal neighborhood the fare is about $2. Or use public transport ($0.25) such as the Ecovia or Trole to get to the nearby Estacion Marin Central. 🗺️ On your own: Quito’s tourism information center is right along Plaza Grande, opposite the Presidential Palace. They can provide a helpful city map (free) that includes many points of interest and walking tour routes. 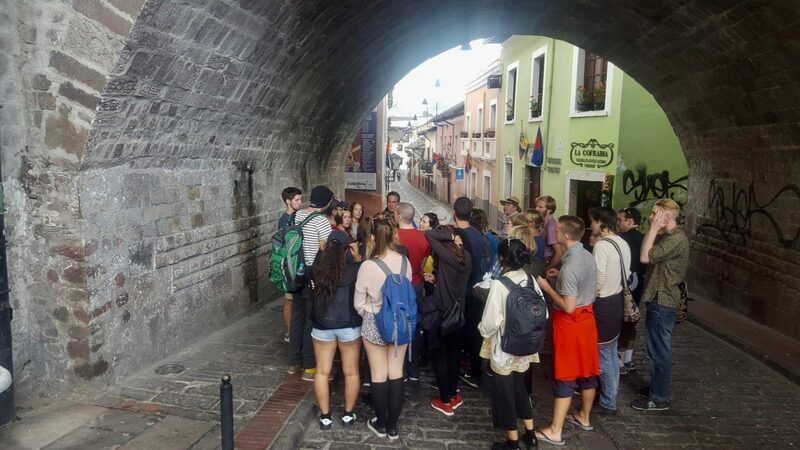 🚶 Quito Free Walking Tour: There is a free (tip-based) Quito walking tour every day, except Sundays, at 10:30 am and 2:30 pm run by the Community Hostel. The 3½-hour tour provides an in-depth look into Old Town, providing interesting background about the city, Ecuadorian culture, and Quito travel tips. A $5-$10 tip per person is suggested. More info here. 🚎 The 1914 Quito Trolley Tour: This 3-hour city tour for $15 provides exceptional value and covers a lot of ground. In addition to all the main sights in the center of Old Town, the trolley is able to go further to include the Basilica and Quito’s famous viewpoint of El Panecillo. This tour can be the best option to see a lot of Quito with little time, ideal for those with one day in Quito and shorter days. Yet it makes a great intro to the city for anyone. It departs popular Quito hotels at 8am Monday-Saturday and at 2pm on Sundays. Check availability for your dates here. 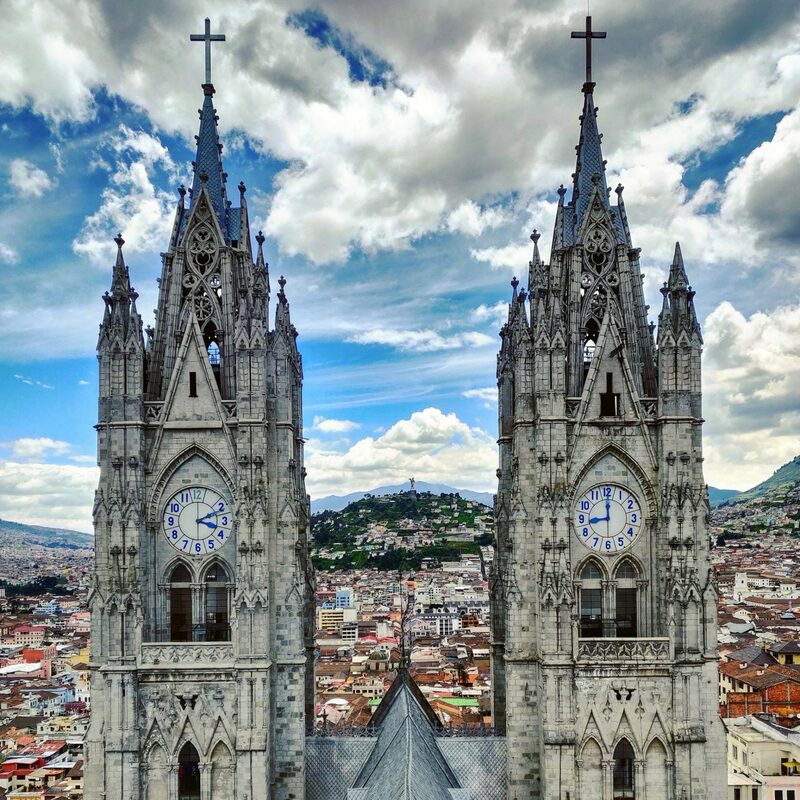 If a visitor were to only go to one of Quito’s many churches, our recommendation would definitely be for the Basilica del Voto Nacional. Quito’s Basilica del Voto Nacional is not just another church. Visit this church, even if you’re not into churches. It is the largest neo-Gothic church in all of the Americas. But it’s not just its grandiosity that makes a trip to the Basilica one of the best things to do in Quito. It can be such an adventurous experience to climb the towers, which reward the brave with stunning views of Quito down below. 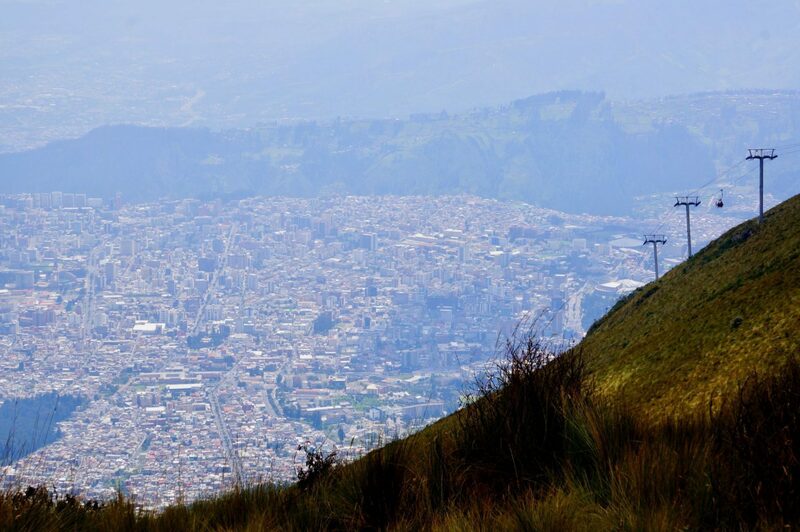 Definitely make sure that climbing this rickety route to the top is on your list of things to do in Quito. Here are more reasons why. 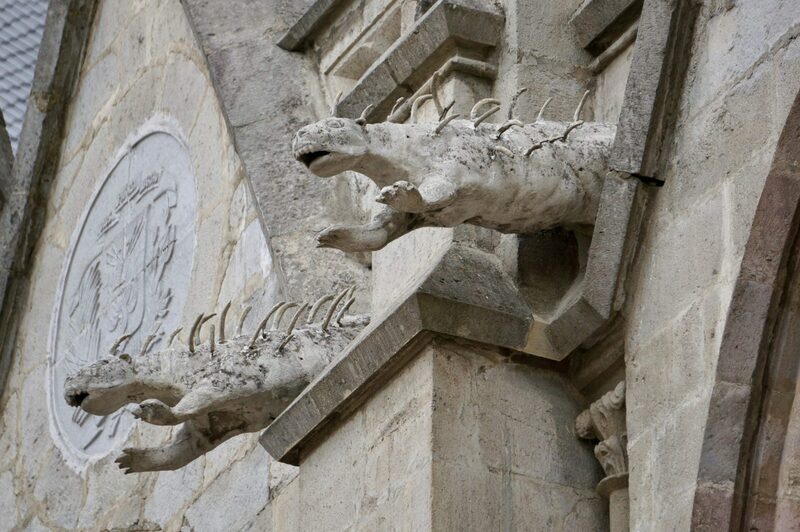 Gothic churches are often defined by their gargoyles. Yet here in Quito, native animals have been put up in their place. Ecuadorian iguanas, armadillos, and Andean condors can all be found lining the Basilica’s exterior. It’s such an interesting sight! And those who don’t know to look may miss it entirely. 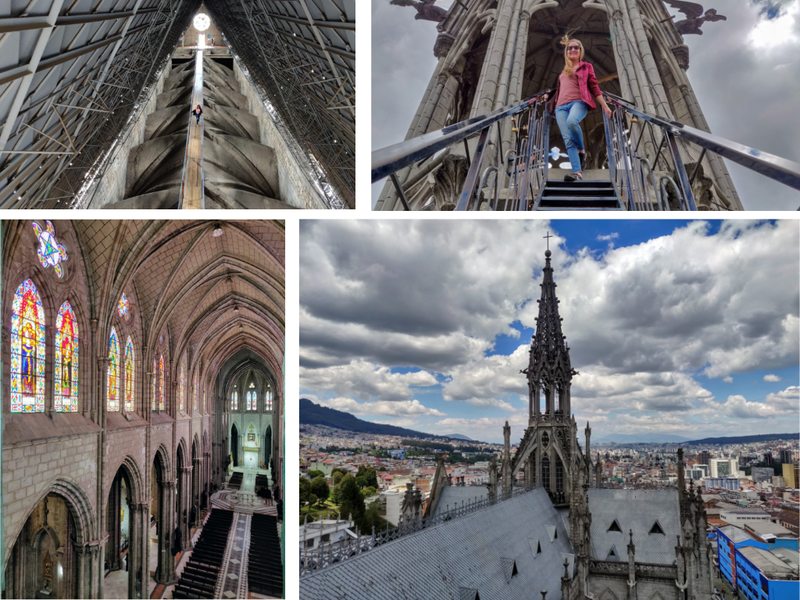 After ascending many steps midway up one of the Basilica’s towers, visitors can walk directly atop the enclosed church roof on a wooden plank walkway that drops off on either side. Then the climb begins on a series of steep & stairs and even ladders. Children and adults regularly turn back out of nervousness. Those who are able to climb higher and higher will finally reach the top to enjoy incredible views. It can all be a little nerve-wracking for those with the slightest fear of heights. But it’s this adventure involved that helps to make a visit to the Basilica such a fun thing to do in Quito! The ladders are sturdy and there is railing. Have a Beer in Church – Really! Perhaps the most unique thing to do in the Basilica is to have a beer in this church! 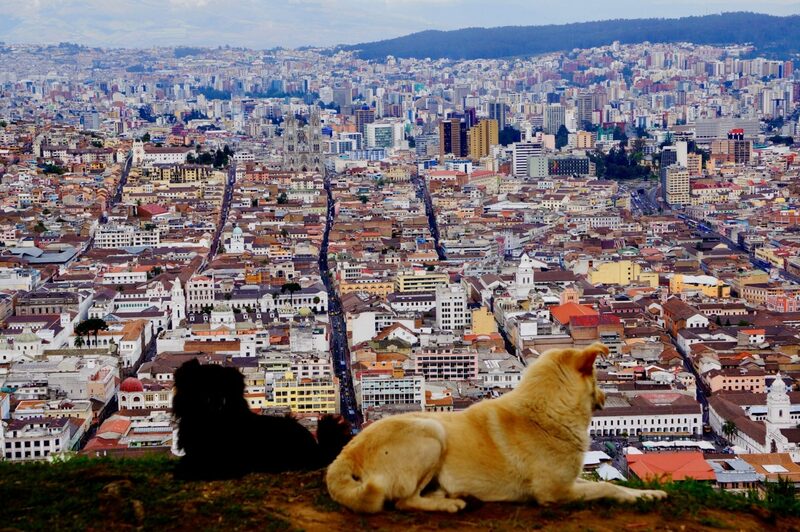 It’s a great way to calm your nerves after the climb, while also taking in those sweet Quito vistas. Before exiting the other tower in the Basilica, walk up the spiral staircase to reach a somewhat hidden café. The views are great here too! So grab a table by the windows overlooking Quito Old Town and enjoy a cold cerveza from inside this place of worship. Doing so may be one of the more unusual things to do in Quito! ⌚ Length of visit: About 1 hour, possibly longer if lingering for a beer. 📍 Location: About a 10-minute walk northeast of Plaza Grande, located here. 💡 Tip: If possible, go on a weekday when it’s less-trafficked to avoid waits that sometimes form at the ladders. The TelefériQo is Quito’s awesome cable car that flies passengers high up into the Andes. It’s pretty incredible to be able to go from the middle of this bustling capital city to then be transported to the peaceful mountaintops, all within just an 18-minute cable car ride. Personally, the teleferiQo is our favorite thing to do in Quito. 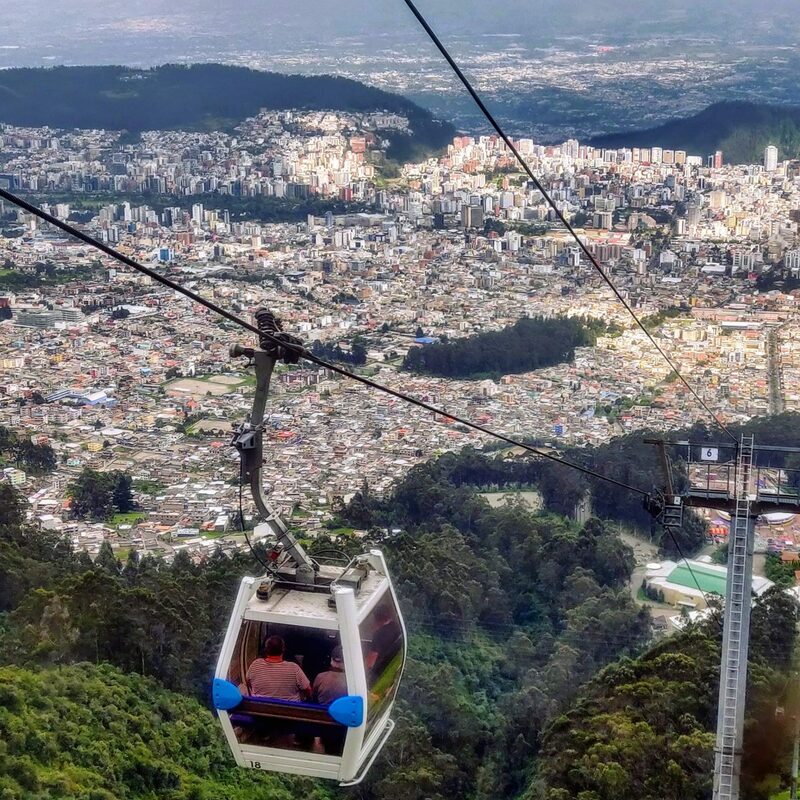 Quito’s TelefériQo is one of the highest cable car lifts in the world, bringing passengers up to an altitude of about 4,000 meters (about 2.5 miles high). The 2.5-kilometer ride on the aerial gondola itself is a lot of fun, but there’s still plenty of things to do once at the top of this must-do Quito attraction. The upper TeleferiQo station is actually on the eastern slope of the Pichincha Volcano! After arriving to the upper station, there’s a lookout platform to soak in the views, hiking trails to trek, horseback riding ($10 per hour), a few cafes to relax at, a swing soaring off the side of this mountain, and some touristic photo opportunities with resident llamas. Gazing way back down towards the city, the lookout platform offers some of the best sweeping views of Quito and gives perspective of just how big the city is, tucked into the mountain valley. 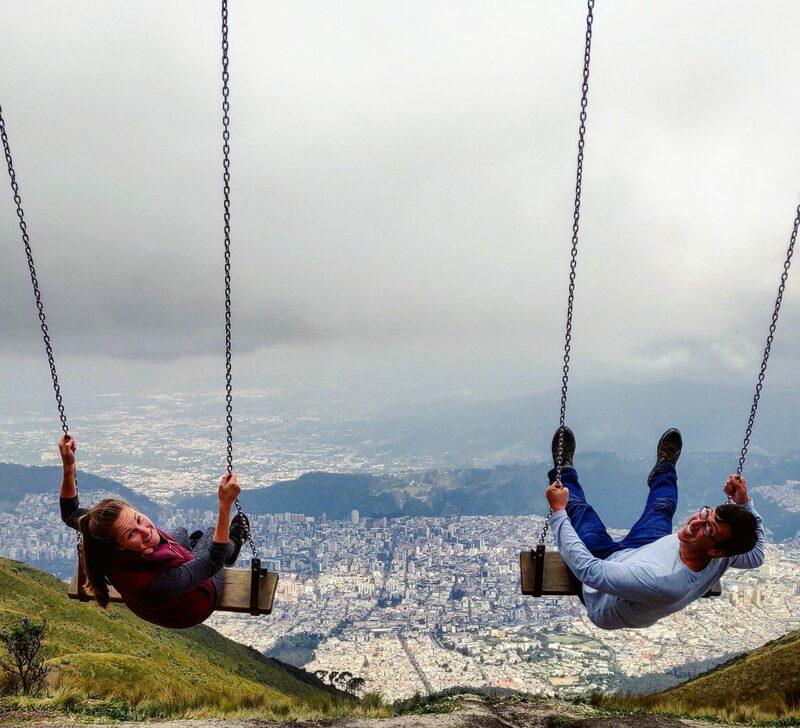 New for 2019, there’s now a thrilling swing for adventurous souls to fly right over Quito! And it’s free. Yet it’s the hiking trails way up here that make for a particularly awesome recreational pursuit. 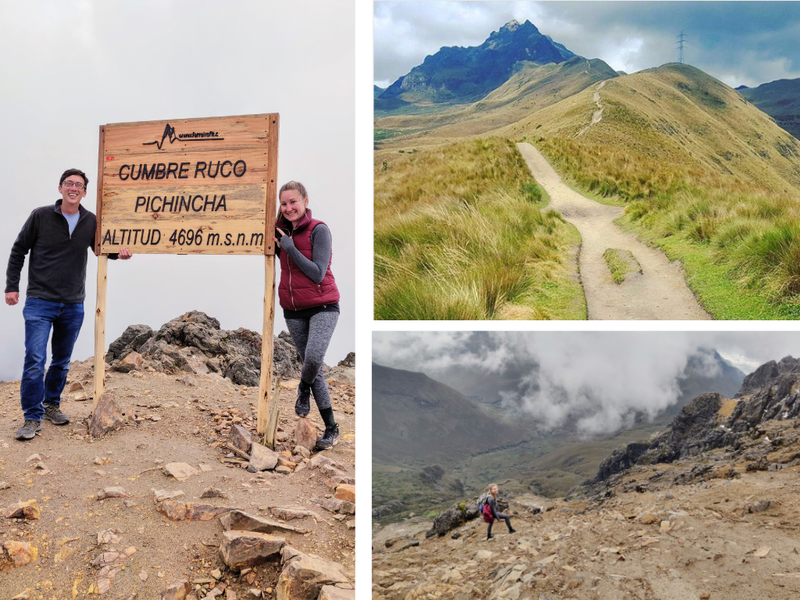 For those who are well-acclimatized, it’s possible to trek the high altitude trail to summit Rucu Pichincha, which takes about 4-5 hours to complete the 10-kilometer roundtrip hike. The trail starts out fairly easy and well-defined. But it becomes a steep and strenuous climb in parts and even patchy snow. There’s a rock scramble toward the summit and this should only be pursued by experienced hikers. Lastly, real thrill seekers can even go mountain biking down the side of this volcano. The TelefériQo permits mountain bikes on the cable car and there is a crazy trail that winds down the side of the mountain. For experienced mountain bikers only, you can contact Flow Bike Rentals, who offers guided trips down the mountain ($70). ⌚ Length of visit: Minimum of 1 hour. Best to allow for 2 hours. Plan 5-7 hours if attempting the cable car + a hike up Rucu Pichincha. 📍 Location: Located here on the western fringes of central Quito. Take a taxi or Uber, which should cost about $3-$5 each way if coming from somewhere central in Quito. 💡Tips: Pack a jacket, as it’s much cooler up here. Go on the TeleferiQo whenever the weather is clear. There are better odds in the mornings. If hiking, wait a few days in Quito to acclimatize before pursuing. La Mitad del Mundo (the Middle of the World) is one big tourist attraction near Quito. This is where the equator passes through Ecuador, which occurs at latitude zero, just north of Quito. Is Going To the Equator Really Worth It? 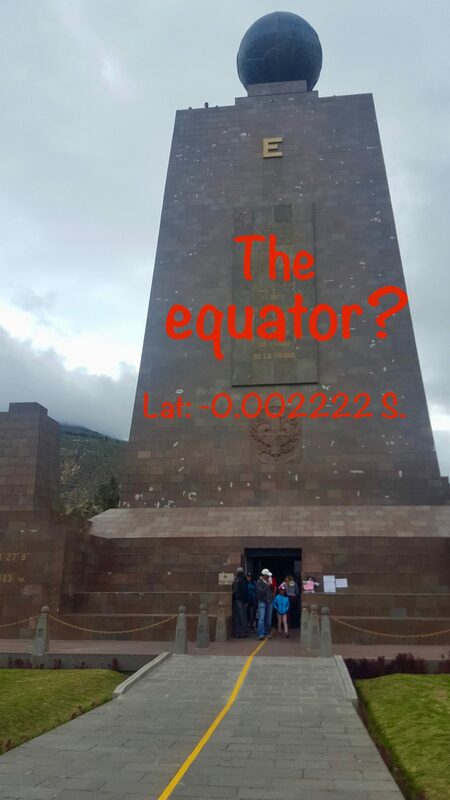 The equator attractions are completely touristy, out of the way from central Quito, and the main monument isn’t even actually on the equator. Despite these downsides, going to the equator can still be a quirky and fun thing to do in Quito, during a half-day diversion outside of the city. For those with only one day or two days in Quito, perhaps the equator attractions could be something to skip. But if you’re in Quito for more than a few days, it’s almost necessary to add this into your Quito itinerary. Come see what all the fuss is about and snap a few equator-selfies! Mitad del Mundo is the location of the main equator monument and that big yellow equator line to snap an equator selfie on top of. Just realize that modern GPS technology shows that the monument and the yellow line was actually erected about 230 meters south of the actual equator. Oops! They haven’t changed the line, nor is there any mention of the inaccuracy at the famed monument. Close enough. The monument here is the main tourist attraction, but there’s an entire “equator city” that surrounds the monument known as the Ciudad Mitad del Mundo (Middle of the World City). There are loads of tourist shops, cafes, a planetarium, a train ride, and other little attractions. 💲Cost: $5. The ticket booth may try to sell a more expensive ticket that includes many of these attractions, but a $5 ticket grants access into the “equator city” and to the monument. 🕒 Hours: 9:00 am – 6:00 pm. ⌚ Length of visit: 30 minutes or so. Longer if visiting many of the onsite attractions. 📍 Location: It’s a 40-60 minute drive from central Quito to Mitad del Mundo, located here. It can be approached by bus, taxi, or tour. More detail on how to get to the equator zone follows. The Museo Solar Intiñan is a smaller and lesser-visited attraction in the equator zone. Yet, it’s no less interesting. The Intiñan Museum is closer to where the equator passes through. Although our GPS showed their equator line was still 90 meters south of latitude 0. 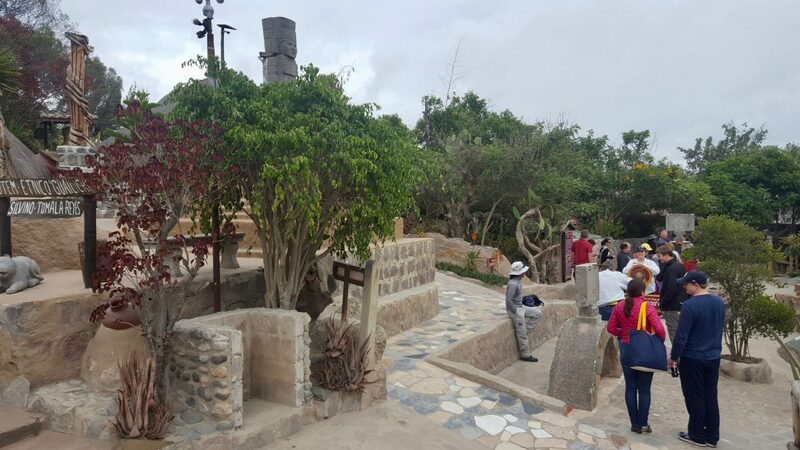 Upon entering this open-air museum, guests are taken for an included 45-minute tour to see kitschy exhibits that have nothing to do with the equator (a shrunken head, a preserved anaconda, etc.). Then it’s on to the main show: the equator. On Intiñin’s equator line, a guide leads visitors through a few funny “experiments,” that we’re skeptical of. For example, water is poured into sinks on each side of the equator to demonstrate the Coriolis Effect in which the rotation of the water changes. But we found the rotation to be due to the direction the water was poured, rather than by the Coriolis Effect. Watch closely! Despite our suspicions of scientific misrepresentations, the Museo Solar Intiñan is all good fun! Go there, have a laugh, and judge the experiments for yourself. 🕒 Hours: 9:30 am – 5:00 pm. ⌚ Length of visit: It’s a 45-minute tour. 📍 Location: Museo Intiñan is located just around the corner from Mitad del Mundo, right here, about a 5-10 minute walk away. The equator area can be approached by bus, taxi, or tour. Complete directions on how to get to the equator zone is below. Which To Visit: Ciudad Mitad del Mundo vs. Museo Solar Intiñan? So which of Quito’s two equator attractions should you visit? We say go to both. If you’ve made it all the way out here on the outskirts of the city, check out both Quito equator attractions. They are both inexpensive, don’t take much time, and are two completely different equator experiences. 🚌 Quito to Equator by Bus: It’s possible to take public transportation to the equator area for cheap. But it can take a few transfers, causing a lengthier journey and can be complicated for those new to Quito. To get to the equator by bus, first make your way to Terminal de la Ofelia, a bus station on the North side of Quito, accessible by many of the city’s public transit lines. From Ofelia, hop on another bus, identified by “Ciudad del Mundo” on the front ($0.35). 🚕 Quito to Equator by Taxi/Uber: The most convenient way to get to Mitad del Mundo is by taxi or Uber. Expect to pay about $15 each way by taxi. An Uber estimate from Old Town Quito to the equator attractions is $12-$18, each way. 🚐 Quito to Equator Tours: There are many different tours from central Quito to the equator area. Most cost $30-$50, so can be a bit pricey. But there is a $12.50 equator tour from Quito (excluding admissions) that departs from Old Town at 2:30 pm, Monday-Saturday. It includes a stop at the Mitad del Mundo monument, the Solar Intiñan Museum, and even the option of ending at the TeleferiQo for sunset. This great value transport option to get to the equator is even cheaper than taking a taxi. You can check availability and make a reservation here. 🚶Going Between the Two Quito Equator Attractions: If using a bus or taxi to get to Mitad del Mundo, it’s possible to walk between the two equator attractions. From Mitad del Mundo, walk North on the side of the highway for about 5 minutes, until reaching a dirt road. Take a left there, which leads to Museo Solar Intiñan. In a city surrounded by mountains, there are great miradors (viewpoints) all along the higher outskirts of Quito. Yet El Panecillo is one of the few lookout points that pops up right from the middle of the city. And it’s capped by a very notable statue. El Panecillo translates to the “The Little Bread Loaf.” This hill in the middle of the city separates North and South Quito. While wandering around Quito Old Town, El Panecillo hill is usually somewhere looming in the background. Go here to get excellent views of the city down below. And on clear days, it’s also possible to see the region’s volcanos. Atop of the Panecillo hill, not only are there great views. There’s also a big Virgin Mary statue that is one-of-a-kind because of her angelic wings. The statue is known as the La Virgen de Quito and is said to be the largest winged Virgin Mary statue in the world. 🕒 Hours: Go up this hill during the day. The interior of the statue is open 9:00 am – 5:00 pm. ⌚ Length of visit: 15-minutes or so. 📍 Location: It’s located on the southern fringes of Quito Old Town, here. 🚕 By taxi or Uber is the recommended way to get to Panecillo. It should cost about $2 each way to/from anywhere in Quito’s Old Town. Note: while there is an inviting stairway leading up towards the top of the hill, locals have cautioned against it and recommend a taxi as a safer option. There are dozens of museums all throughout Quito. In fact, there is said to be more than 50 museums spread across Ecuador’s capital! Since these museums are all indoor, museums can be the perfect solution for things to do in Quito on a rainy day. 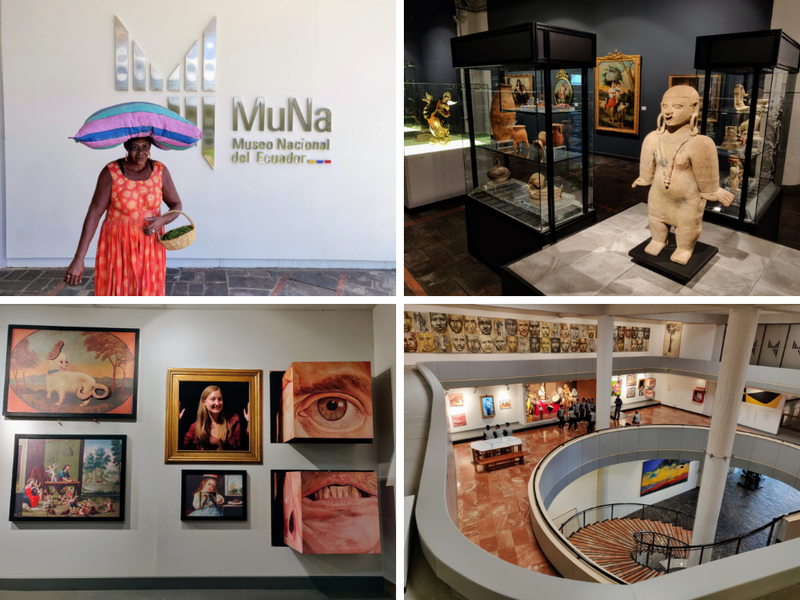 For Everything Ecuador: *Museo Nacional* – Ecuador’s expansive National Museum contains a large and impressive collection of Ecuadorian artwork, historical exhibits, and artifacts. The National Museum has finally reopened in 2018 after a prolonged renovation. It’s a great free museum – go! Yet perhaps the most popular museum in Quito is the adjoining La Capilla Del Hombre and Museo Guayasamín ($8). If only visiting one museum in Quito, this is likely the best bet. And particularly so for art-lovers. Oswaldo Guayasamín is arguably Ecuador’s most famous painter. Even for those who have never heard of this artist, there’s much to learn about Guayasamín at this museum. Most visitors depart with a newfound respect and fascination for the artist. “The Chapel of the Man” is his masterpiece building that he personally designed before his death (1999) to showcase his master works. The neighboring home/museum offers a peek into Guayasamín’s life, while showing off some of his prized collections, his bedroom, his working art studio, and more of his art pieces. 💲Cost: One $8 entrance ticket gets visitors into both adjacent museums. 📍 Location: The museums are perched up on a hill in New Town, in the Bellavista neighborhood, exact location here. Take a taxi or Uber, which should be just a few dollars, depending where you’re arriving from. 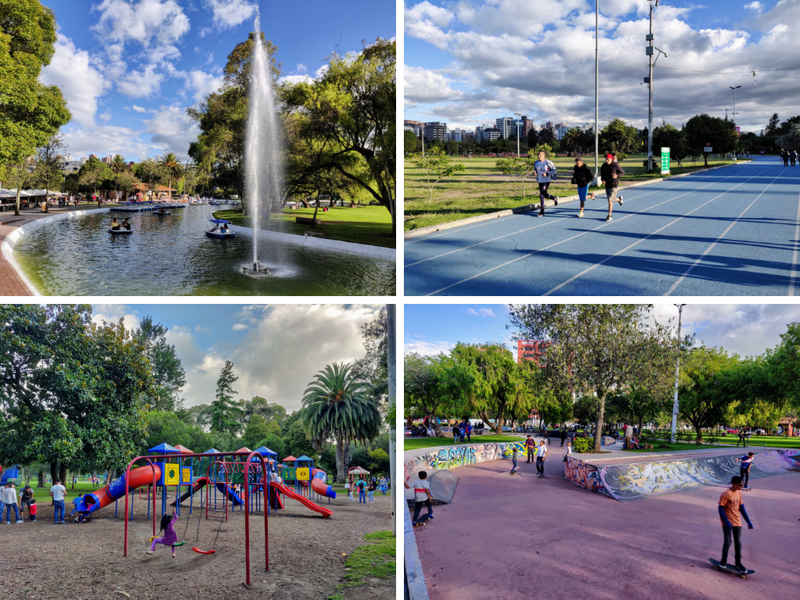 For such a busy South American capital city, there’s a refreshing number of parks and green spaces scattered all throughout Quito. If the busy streets and bus exhaust become a bother, these parks are the perfect escape right within the city. In Quito’s parks, visitors can be greeted by hummingbirds in the fresh air amongst a forest of trees. Our best Quito park suggestion is: Parque Carolina. This big park right in the middle of the city is somewhat reminiscent of New York’s Central Park. But Parque Carolina is distinctly and charmingly Ecuadorian. Carolina Park is best experienced on weekends, when it seems all of Quito comes here for some outdoor fun. Lots of food vendors are set up to serve Ecuadorian favorites like fritada, ceviche de chocho, fresh juices, and more. It’s not surprising to find some sort of festival going on or even a concert. Yet Quiteños come to Parque Carolina for a bit of recreation within the city. There’s more than just futbol fields, playgrounds, and running tracks here. Parque Carolina boasts the largest free skatepark that we’ve seen anywhere in the world. There’s also a man-made river in which park-goers can rent paddle boats for a leisurely float around the park ($4.50 per boat, per half hour). 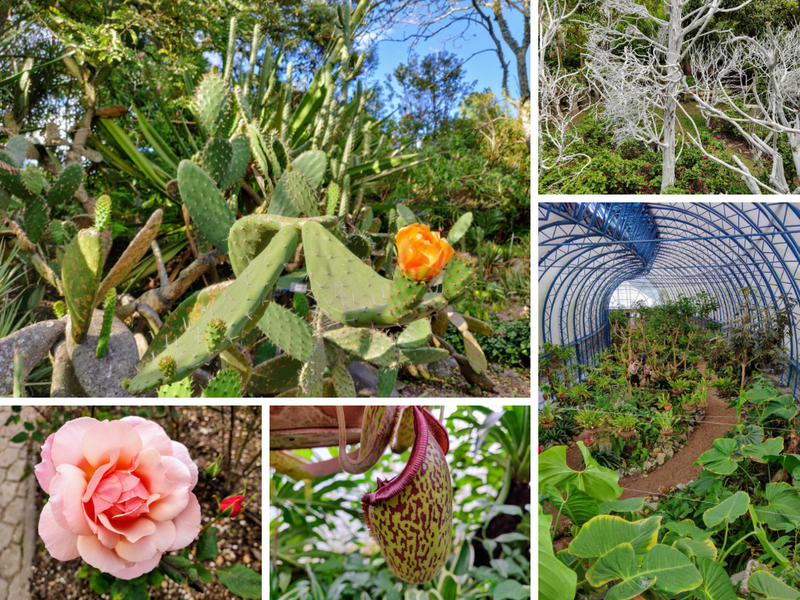 Perhaps most notable for travelers, within Parque Carolina there’s the really well-done Quito Botanical Gardens. The expansive garden with meandering trails and multiple greenhouses offers a glimpse into the different regions of Ecuador, from the high paromo (alpine) to lowland jungle environments. Both the rose garden and orchid garden are pretty highlights. There’s even a Japanese zen garden. But perhaps most interesting is the greenhouse showcasing carnivorous plants! 📍 Location: Right in the middle of Parque Carolina, here. It’s a healthy climb up the many flights of stairs on the eastern side of Quito’s Old Town to reach the area known as Itchimbía. Itchimbía is where that big orange Quito sign makes for great photo ops overlooking the city. So after catching your breath from climbing the stairs, go check out the sign and pose for a selfie. 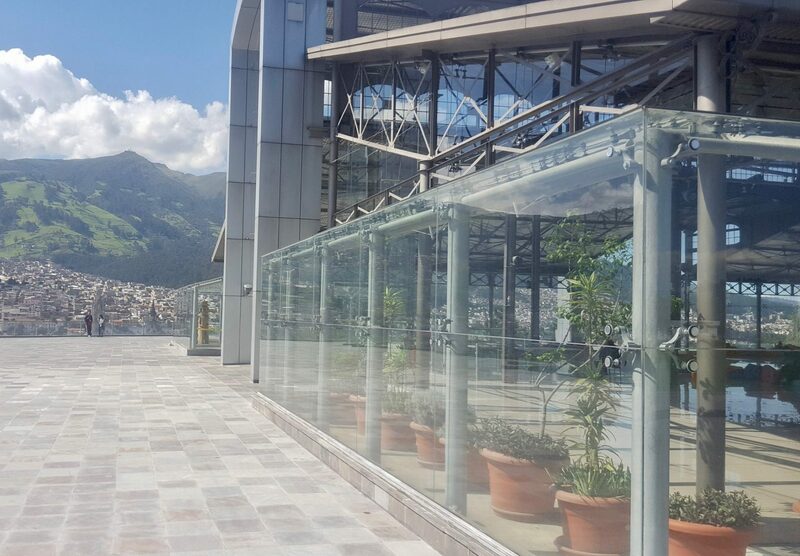 Itchimbia is also home to Quito’s Crystal Palace. This massive structure of iron flanked with glass walls was shipped over from Germany over 100 years ago. It’s said to resemble the Las Halles market in Paris, and as such, has served as a market itself. The Crystal Palace now functions as a cultural center that hosts events. Yet it often sits empty, making for a particularly pleasant chill-out spot in Quito that is complete with bean bag chairs. A third great reason to make the trek up to Itchimbia is simply for more sweet views of this awesome city. For the best photos, visit Itchimbia during the morning. That’s when the eastern sun lights up the Old Town to the west. While the afternoon sun isn’t favorable to taking pictures towards the west, there’s a different great reason to go at this time too. On the street just below Itchimbia Park, Manuel Samaniego, there are three restaurants all directly next to one another. They each offer spectacular views of the city as you dine and are in the perfect position to watch the sunset over Quito. At the very least, consider popping in for a drink to reward yourself for climbing up all those steps. We enjoyed Cafe Mosaico. But you can also try Vista Hermosa and Pideme La Luna. 🕒 Hours: Go during daylight hours. Note that the 3 restaurants just below Itchimbia don’t open until 3:00 or 4:00 pm. 📍 Location: It’s possible to walk here directly from Old Town. The stairway to get to Itchimbia is not on Google Maps but the stairs begin right here, a 1 km walk from Plaza Grande. The Crystal Palace atop Itchimbia is located here. It’s also possible to take a taxi/Uber. Plaza Foch is the party place in Quito. All around the central plaza in New Town, there are many cafes, bars, and clubs. It’s in this area that young Quiteños mix with travelers who frequent the area, each looking for a good time. An evening partying around Plaza Foch may be the most fun thing to do in Quito at night. Plaza Foch is a place for celebrations and revelry. Grab a table outside, as Plaza Foch can be equally as good for people watching as it is for drinking. But Plaza Foch is more than just loud clubs. Cozy bars and even a number of craft beer pubs are also found in this area. More on the latter in section #12 of this Quito travel guide! 💲Cost: Free. At night, some of the clubs will charge a modest cover but include a drink. 🕒 Hours: Go anytime really, but Plaza Foch really lights up with the later crowd. 📍 Location: It’s a very central location in New Town in the La Mariscal neighborhood, located right here. Speaking of drinking in Quito, La Ronda street is another good place to do that. This quaint pedestrian walkway slices right through Quito Old Town. With its balcony-lined cobblestone street, it may just be one of the most scenic stretches of Quito’s historic center. A few shops and many cafés line this picturesque cobblestone alleyway. These buildings actually date way back to the 1600’s, so it makes for a particularly inviting setting in Quito to stop in for a drink. Find an empty table at any one of these second-level balconies and order the specialty here: a canelazo. 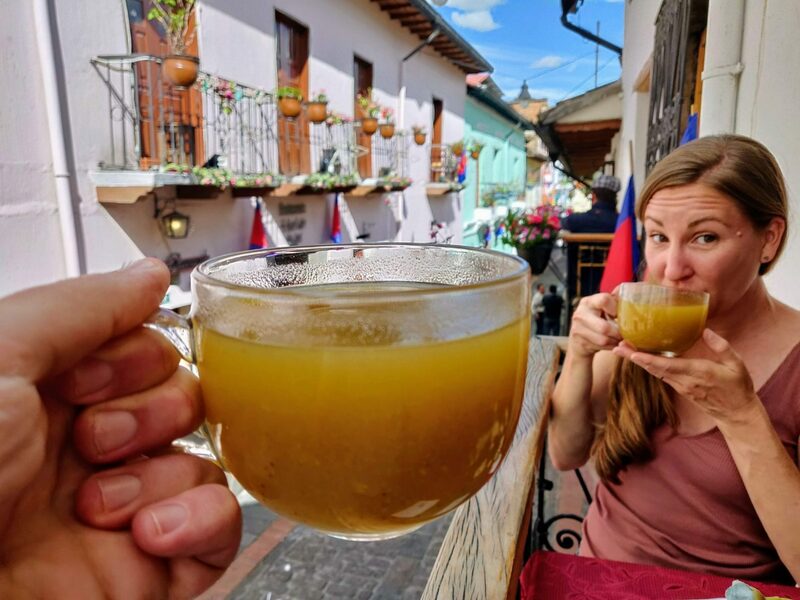 Canelazo is a warm alcoholic drink that’s found throughout the Ecuadorian highlands. This distinctly Ecuadorian beverage is made from hot cinnamon-sugar water that’s usually flavored with local fruit, most commonly naranjilla. Aguardiente (sugarcane alcohol) is added to give canelazo its kick. The strength of canelazo can vary drastically. Canelazo tend to be quite sweet, with lots of panela (raw sugar) added. But the spiciness of the cinnamon and the citrusy tang of the naranjilla fruit helps to balance it out. Canelazo is a popular drink throughout Quito during December, particularly so for Fiestas del Quito and Christmas. But on La Ronda, canelazo is popular all year long. And we can’t think of a more perfect setting to sip on canelazo than perched up on a balcony in La Ronda. 💲Cost: Big glasses of canelazo average about $2.50 on La Ronda. 🕒 Hours: In the afternoon you’ll have a great chance of scoring a balcony table. At night, it’s more of a party atmosphere. 📍 Location: Easily accessed from Quito Old Town and located here. One of the best things to do in Quito is simply eat! Ecuadorian food is delicious and there are some particularly tasty regional dishes to the Quito area to be on the lookout for. This is a creamy and hearty soup that’s quite popular throughout the Ecuadorian Andes. But it is most iconic of Quito to the point that it’s sometimes even called Locro Quiteño. It’s a soup made with three of our favorite local ingredients: potato, cheese, and avocado! Locro de papa is rich & creamy and a perfect way to keep warm in these higher elevations. A white mozzarella-like cheese is what’s used in the milk-based broth that’s further flavored with onion, garlic, cumin, and ground annatto seed (achiote). It’s all topped with freshly sliced avocado – yum! It’s vegetarian-friendly too! 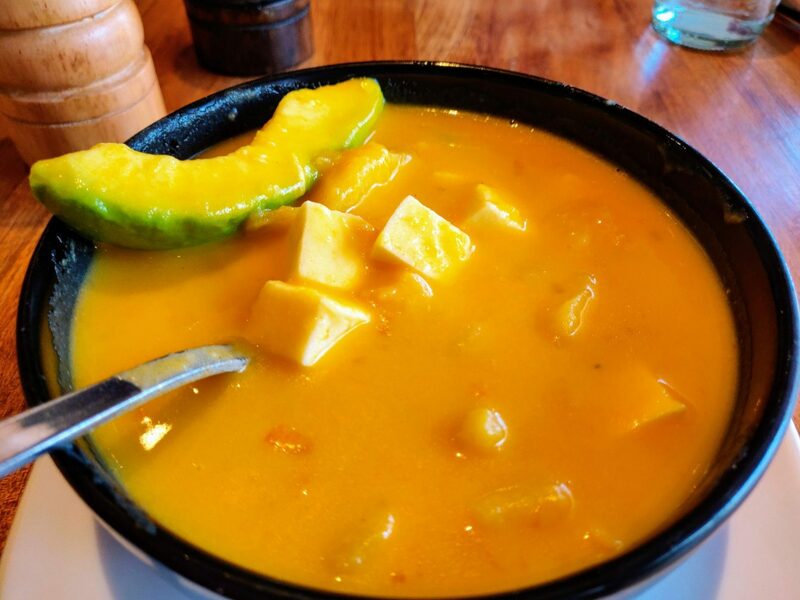 Locro de papa is commonly found throughout Quito. In Old Town, try the locro de papa in the historic courtyard surroundings of Hasta la Vuelta, which is a bit pricey for this soup at $8, but the atmosphere and quality helps make up for it. Translated to “wind empanadas” because of the airy interior that’s created when it’s fried. 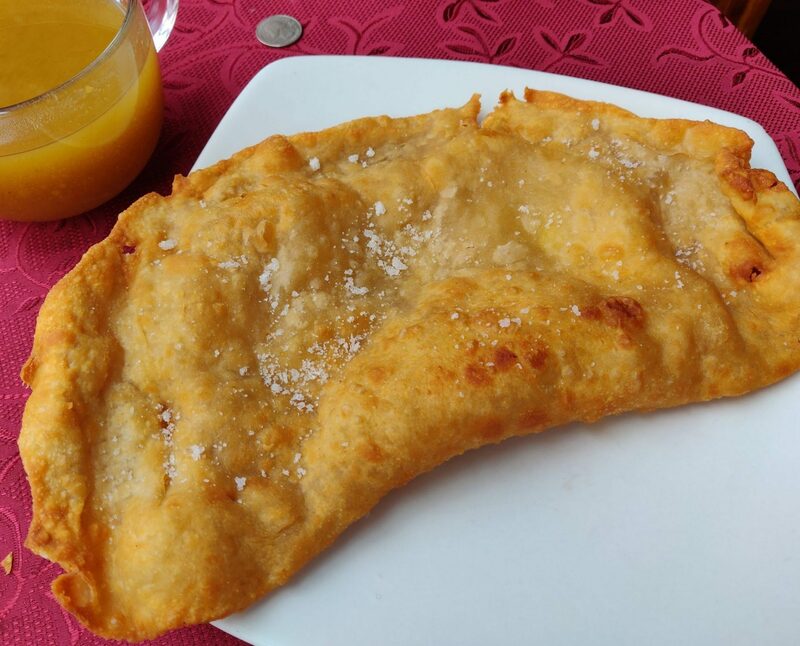 Gooey melted cheese is tucked inside the crispy fried dough and a bit of sugar is sprinkled on top. These snacks are often huge and sharable. It pairs great with a canelzao. They can be found throughout Quito, yet are very common in La Ronda. Expect to pay $2-$4, depending the size and location. Fritada has many components but is anchored by flavorful pork. It’s boiled in spiced-up water until it evaporates, when the pork is then fried in its own fat. This culminates in some tasty pork morsels that are good on the own merit. 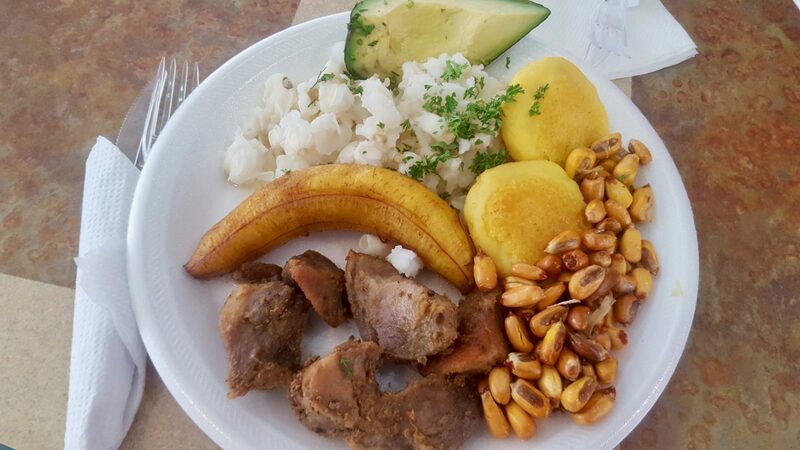 But one of the best aspects of fritada is the variety of sides it comes with, such as what you see in the picture below: hominy, toasted corn, avocado, ripe plantain, and llapingachos. What are Llapingachos? They’re fried potato pancakes stuffed with cheese. Often served as a side to many dishes in Quito. Be sure to try them too! Where to find good local food in Quito? For lunch in Old Town, one of the best places to try local Quito cuisine is at the Mercado Central. An array of food stalls awaits to compete for your business. Prices are inexpensive and all of Quito’s classics can be found here. It’s also a great place to mix with the local Quiteño crowd. 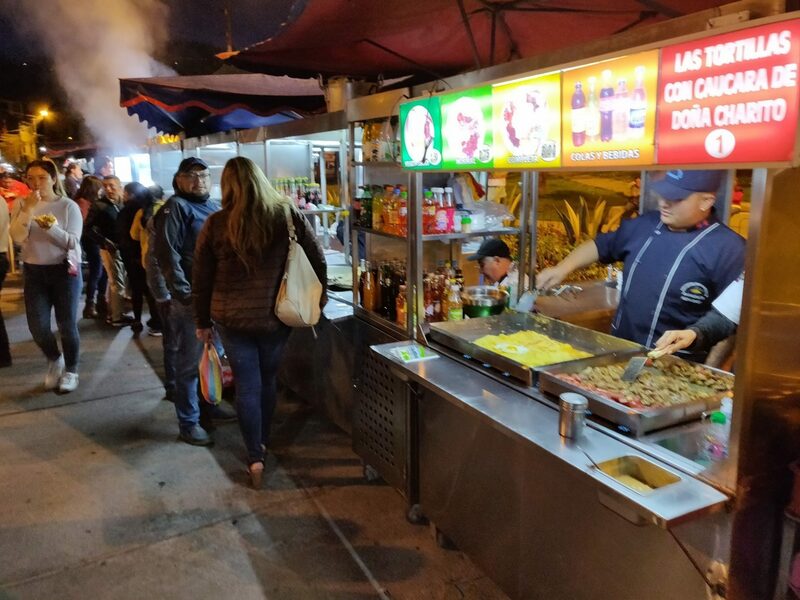 For dinner in La Floresta try the street food stalls in Parque Navarro, which similarly sports a charmingly local vibe amidst this neighborhood that’s better known for its upscale restaurants. If you’re either a foodie who wants to explore Ecuadorian cuisine further or simply hesitant to approach unfamiliar street foods on your own, then definitely consider taking this Quito Food Tour which is $25 including lots of nibbles. But it’s only offered on Friday nights. There’s no better way to wash down Quito’s street food than the city’s delicious craft beer. Quito’s craft beer scene is exploding right now and there are great microbreweries scattered all throughout the capital. 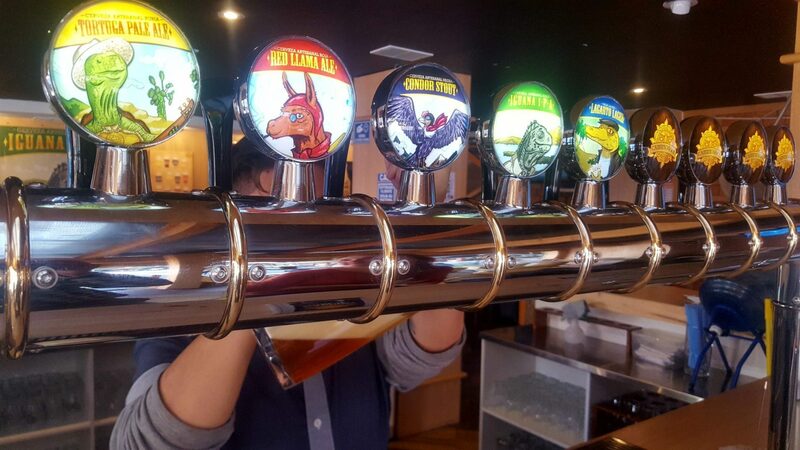 In traveling extensively in Ecuador, we can definitively say that Quito has the best craft beers and the most brewpubs anywhere in the country. This makes for a fantastic opportunity to go on a craft beer pub-crawl in Quito. It’s possible to create your pub crawl or leave it to the professionals by joining an organized Quito Craft Beer Tour. 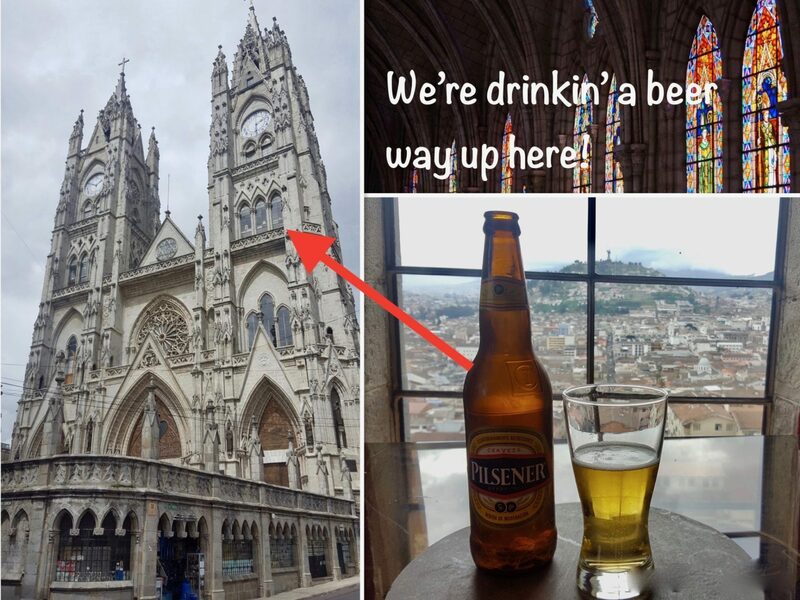 Both options are a blast for any beer-lovers traveling to Quito. For an easy and fun way to discover the best craft beer places in Quito, book this Quito Craft Beer Tour. A designated driver conveniently takes drinkers around to three notable Quito brewpubs. The modest $44 price not only includes the transportation, but also beer at each brewery and a liquid welcome gift! 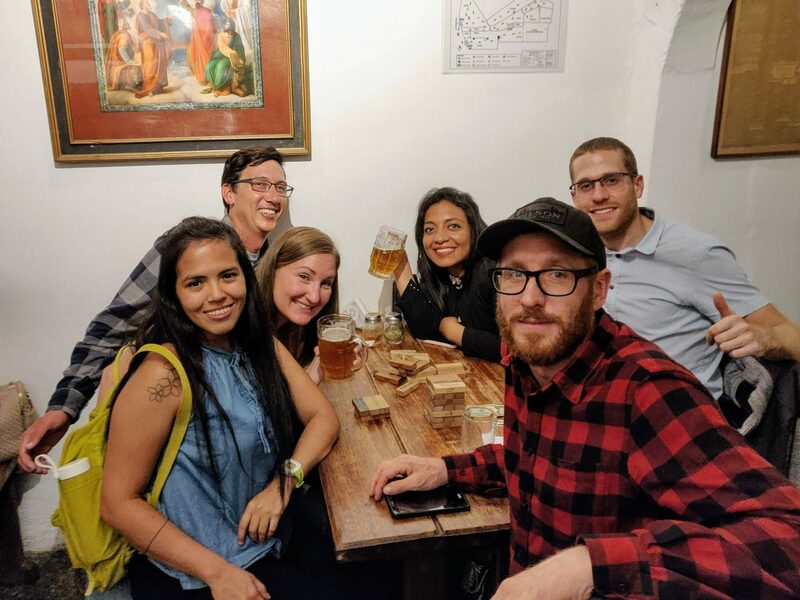 Besides the convenience of a driver, guest also learn a lot about the flourishing Quito craft beer scene and potentially meet some of the brewers. Check the availability calendar and recent reviews here. Or form a craft beer pub crawl of your own. Some Quito brewpubs are within close proximity of each other to walk. Uber and taxis make it easy getting to further flung microbreweries. All in the name of research, we visited over a dozen craft breweries in Quito. Below are some of the favorites that we recommend, with happy hours noted to save you a few bucks while sampling some of Quito’s finest brews! 🍺 Bandido Brewing is our favorite brewpub in Quito Old Town. During the weekday 4-7 happy hour pints are $3. 🍺 Santa Rosa Cerverza recently opened this second location to now offer Old Town some of the best beers in Quito. 🍺 La Oficina brews up their own San Blas beers, which are decent and very well-priced. $4 pints drop to $2 during their generous 5:00-7:00 happy hour. 🍺 ABYSMO Brew Pub has some high-quality brews in Quito. Great IPAs, but it’s the bourbon stout that is the best of its kind in Ecuador. Half-liters $5.50-$6.50. 🍺 Santa Rosa Cerverza Artesanal Bar arguably has some of the best craft beer in Quito. The IPAs are excellent, particularly the Dark IPA. Pints: ~$6. A Tuesday-only happy hour drops select taps to $3.50 from 4:00-8:00. 🍺 Bandidos del Paramo: This Quito brewpub is a taproom collaboration of two established Quito craft breweries: Bandidos and Paramo. Happy hour is 3×2 beers until 8:00. Now with two locations (1) Plaza Foch and (2) Whymper. 🍺 3 Monjes: La Floresta staple with some particularly strong and tasty brews. $5.50 half-liters. 🍺 Cherusker Cerveceria: Cherusker goes for a German flair and it’s their German styles that shine the brightest. We recommend the Bavaria Wheat Beer. 5 beers on tap. $3.50-$3.90 per pint. 🍺 Indie Beer Company: 6 beers on tap (2 of their own, 4 guest taps.) $4.50 per pint, or 2 for $6. Pleasant atmosphere with okay beer. 🍺 Cervecería Camino del Sol: This is a fairly common craft beer brand in Ecuador and their Plaza Foch brewpub makes a convenient location. 5 beers on tap. $4.90 per half-liter. The beer is decent and the label artwork is awesome. La Floresta is a trendy Quito neighborhood in New Town with some excellent restaurants. Big historic hacienda-type houses help to define this Quito enclave. Yet it’s the flourishing street art scene that’s really beginning to make this neighborhood shine. 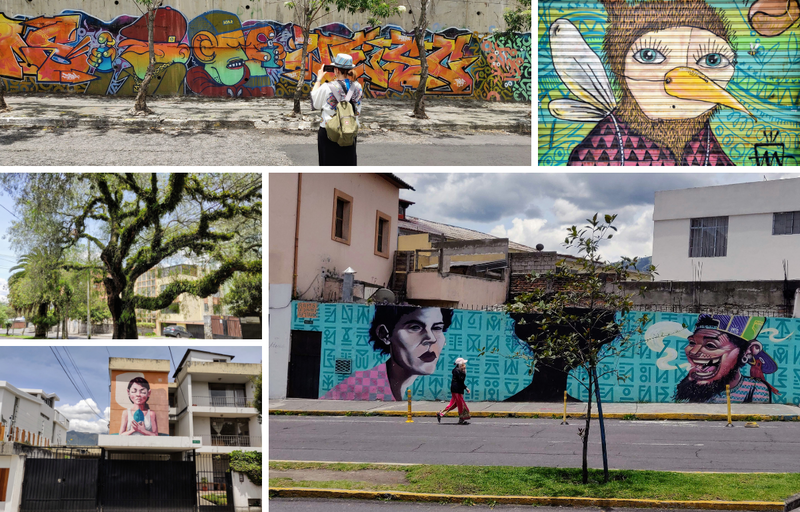 Dozens of intricate murals and tasteful graffiti can be found all throughout La Floresta. It can be like walking through an outdoor art museum! But to see the best works, you must know where to look. Thankfully there’s a great street art walking tour of La Floresta. The free (tip-based) walking tour hits all the most notable places in La Floresta, led by a passionate and knowledgable street artist. While street art is the focus of this La Floresta tour, it also takes in some of the neighborhood’s best viewpoints, a visit to an artist’s workshop, markets, and more. It makes an interesting exploration to discover a different side of Quito. 📍 Location: Meeting point is at the Swissotel. 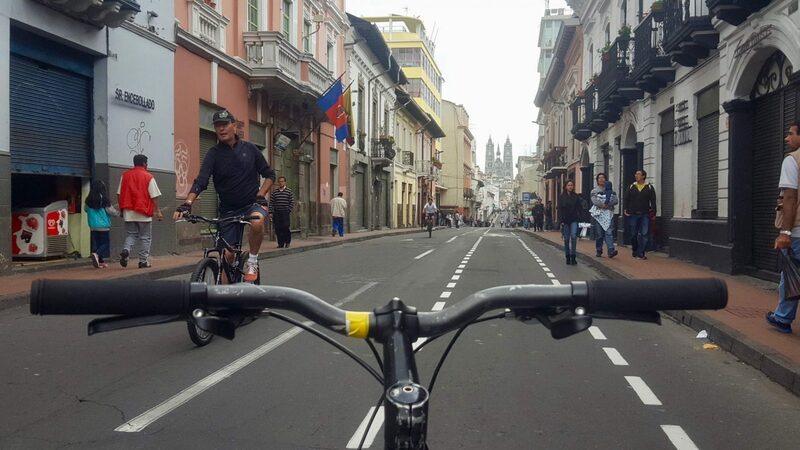 Every Sunday morning beginning at 8:00 am, a 30-kilometer stretch of Quito’s streets is closed-off to vehicular traffic so that cyclists can enjoy a car-free ride around Quito. It’s a fantastic way to mix with locals and cover a lot of ground across Quito. The Ciclopaseo has an interesting route that meanders from highways in New Town to the cobblestone streets of Old Town and even passes right through a few of Quito’s parks! Many places around town tend to be closed on Sunday, so the Ciclopaseo can be one of the best things to do in Quito on Sundays. Take to two wheels and explore the city from behind the handlebars! Here’s a glimpse into what that’s like. 💲Cost: $3 per hour or $12 for the day. Pay upon returning the bike, based upon the time used, rounded to the nearest half hour. The bike rental places sometimes require to retain TWO forms of collateral for each person. Acceptable collateral is ID, passport, and even your mobile phone. Come prepared. 📍 Location: Bike rentals can be found every few blocks along the route between 8:00 am and 1:00 pm. If in Old Town, Plaza Grande is a central point where there’ a guaranteed bike rental stand. If staying around the Mariscal neighborhood, simply stroll anywhere along Av Rio Amazonas, a major avenue of the Quito Ciclopaseo route. Walk up that street to find bike rental stands. How cool is this! Every Monday in Quito, there is a big changing of the guard ceremony outside of the Presidential Palace, also known as Carondelet Palace. 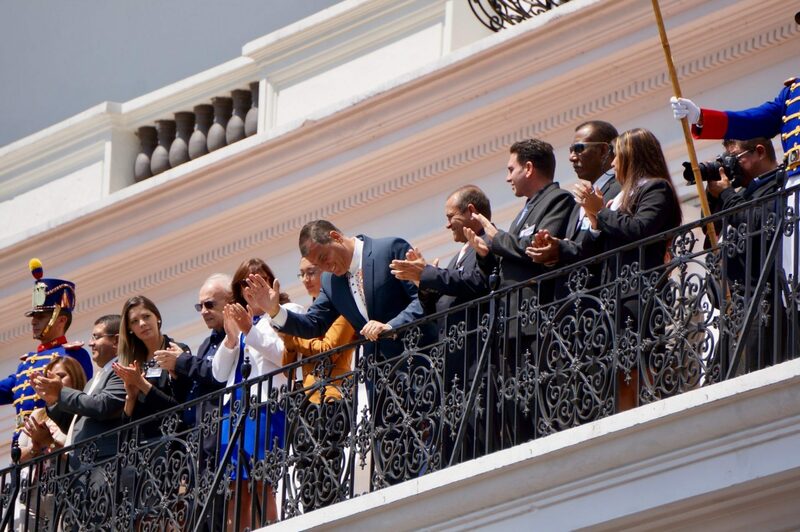 During this procession, it’s a weekly tradition for the president to come out and wave to the crowd gathering on Plaza Grande down below. It’s all quite the pomp and circumstance! A marching band parades through. Guards on horses have a choreographed moment. And then everyone in the plaza gets a chance to wave to the President of Ecuador. If in Quito on a Monday, it’s highly recommend to squeeze this procession into your Quito itinerary. Greeting the President may be one of the most unique free things to do in Quito. Occasionally the president misses the weekly tradition, but the changing of the guards still takes place, regardless of his attendance or not. It all goes down in Plaza Grande every Monday at 11:00 am. ⚠️ Important tip: Be extra vigilant of pickpockets as the plaza gets crowded during the ceremony and many become distracted while sneaky pickpockets are out in force. It’s also possible to tour Quito’s presidential palace! This is an interesting opportunity to be able to tour the Ecuadorian equivalent of the White House. And it’s yet another free thing to do in Quito. The grand tour can take up to two hours, visiting the stately interior of offices, banquet rooms, courtyards, and the balcony. New for 2019, there is no longer a ticketing system and now advanced reservations are required. Info below. 🕒 Hours: Tuesday-Sunday 9:00 am – 4:00 pm. 📍 Location: Plaza Grande, located here. Perhaps one of Quito’s best attributes is its Andean location. This lends itself to so many awesome Quito day trips & excursions throughout the region. We attempted to explore the surrounding mountains at length so that we can give you our recommendations for the best Quito day trips. Although each of these suggestions can most certainly be accomplished by day trips, you may want to consider doing some of them as overnight trips if you have the time. You’ll get a chance to explore each of these place deeper and you likely won’t regret the decision. That said, each can still be accomplished on a day trip from Quito. The Mindo Cloud Forest is a fascinating environment located less than a two-hour drive down the Andes from Quito. This cloud forest is similar to a rainforest, but the elevation and nearly constant low-lying cloud cover is what makes Mindo a cloud forest instead. People come to Mindo from all over the world for its biodiversity that boasts over 500 bird species! Yet Mindo is highly recommended not only for its nature and birding, but also for adventure! In Mindo, there are many recreation pursuits. Common outdoor activities in Mindo include hiking, canyoning, repelling down waterfalls, zip lining, hand-pull cable cars, rope bridges and river tubing. 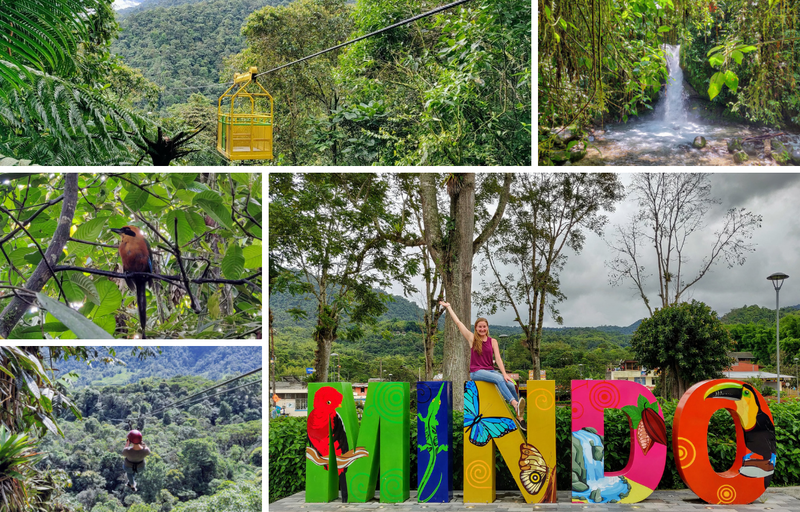 And Mindo may have some of the best value adventure activities we’ve seen anywhere in the world! To give an example, zip-lining starts at $10 for a half-course run through the cloud forest and tube rafting is $6! In addition to the many adventures in Mindo, there’s also a worthwhile butterfly garden ($7.50), a chocolate factory ($10), and quaint riverside cafes to relax at over a beer. While it is possible to visit Mindo as a day trip, those who enjoy outdoor adventure should consider a minimum of staying one night if time allows. Personally, it’s one of our favorite places in Ecuador. If you’re like us and also enjoy nature and adventure, then be sure to read our separate travel guide that details the: 10 Best Things To Do in Mindo Cloud Forest. • weekdays: 8:00, 9:00, 11:00, 13:00, 16:00. • weekends: 7:40, 8:20, 9:20, 11:00, 13:00, 14:00, 16:00. Returning from Mindo to Quito, buses run between 6:30 (first bus) to 17:00 (last bus). Mindo Day Tours: If you only have time for one day in Mindo, a day tour is the best option. 🚐 EcuaTraveling is a reliable agency in Quito that offers a Mindo Day Tour on Fridays only for $50 (excluding activity costs). Book once in Quito or try their email form. For the convenience of online booking with free cancelation, this Friday Mindo tour can also be booked on Viator for slightly more. 🚐 Carpe DM is a reliable tour operator that offers a Mindo Day Tour. At $50, it’s the least expensive Mindo tour we’ve seen, but that pricing is only available when there is 3 or more people. 17) Quito to Cotopaxi Day Trip May Be Quito’s Best Adventure! A day trip from Quito to Cotopaxi is a must-do excursion for any travelers who enjoy adventure. This glacier-capped beauty is one of the tallest active volcanoes in the world and is the 2nd highest point in Ecuador. The summit is 5,897 meters (that’s an elevation of about 3.6 miles high)! To reach the summit of Cotopaxi, it takes a grueling overnight ascent that is occasionally off-limits due to heightened volcanic activity. 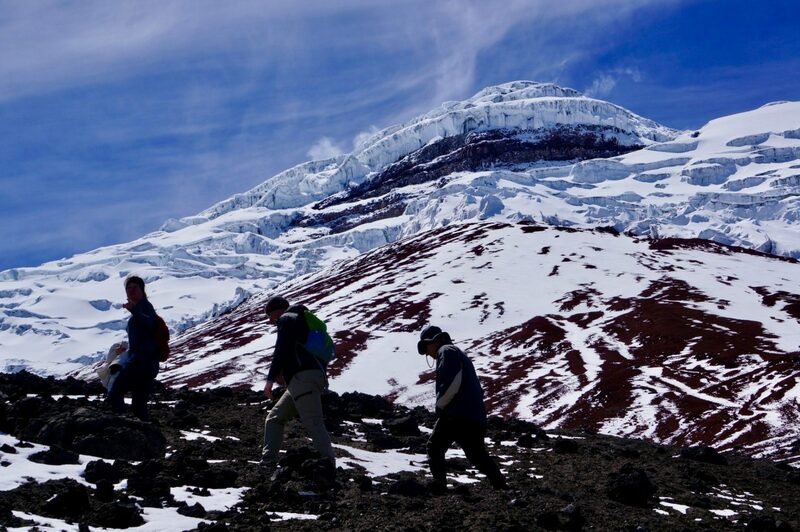 But during Cotopaxi day trips from Quito, it’s still possible to trek as far up as base camp at an elevation of 4,864 meters! The journey begins after breakfast with a drive through the clouds and up the side of Cotopaxi. Wild horses can often be spotted in this area of Cotopaxi National Park. The dirt road eventually ends and that’s when the hiking begins. It’s a steep yet short trek of perhaps a kilometer or two. But the lower oxygen levels at this altitude makes it a more difficult trek up the volcanic terrain. Depending on weather conditions at the time, there’s a chance of snow towards the Cotopaxi base camp. It’s there that hikers can warm up with some hot chocolate or try the coca tea to help combat any potential altitude sickness. Yet perhaps the most thrilling part of the Cotopaxi day tour is the descent! For those who have opted to take a Cotopaxi day tour, mountain bikes provide a bumpy ride down the side of this active volcano! It’s awesome, and the entire experience makes for one of the best Quito day trips. Quito to Cotopaxi ❌🚌 Bus: It’s not possible to travel all the way from Quito to Cotopaxi by bus. Instead, a bus can be taken to a turnoff near the volcano, where there are sometimes unofficial tour guides with 4×4’s to continue up the volcano. While this may save a few bucks, it’s unreliable and we didn’t see any 4x4s at the turnoff. ❌🚕 Quito to Cotopaxi Taxi: It’s possible to find a taxi willing to drive to Cotopaxi for the day. Expect to pay ~$100 for the return trip. But without 4-wheel drive, the taxi likely won’t be able, or willing, to drive towards the top of Cotopaxi for the trek to base camp. 🚂 Quito to Cotopaxi Train: There is a tourist train that runs from Quito to Cotopaxi, but it’s doesn’t let passengers off to hike up Cotopaxi. Instead, the train is more of a relaxing day that only goes near the base of the volcano for a short walk. Best for those not wanting to trek. Be forewarned it does not go up Cotopaxi and the volcano may be obscured by clouds. The $39 trip runs Friday, Saturday, and Sunday, by Tren Ecuador. • Best for 3+ people who want to bike: We did our hike-and-bike Cotopaxi Day Tour with Carpe DM and recommend. The price starts at $50 if there’s at least 3 people, which is the lowest we found. Price includes breakfast, lunch, snack, guide, transport, entry to National Park, and the mountain bike. • Best for non-bikers: For a Cotopaxi day tour that spends more time on the mountain and without mountain biking, this highly-rated tour is the best option. It’s only $60, departs every day, has great reviews, and there are no minimum group requirements. Book on GetYourGuide. • Best for 1-2 people who want bike: Ecuatraveling offers a hike-and-bike Cotopaxi tour for $55 on Wednesdays, Fridays, Saturdays, and Sundays, has no group minimums, and can be booked in Quito or using their email form. 18) On Laguna Quilotoa Day Trip You Can Swing on the Edge of a Crater! A day trip to Laguna Quilotoa Crater is a very popular thing to do from Quito. This former volcano collapsed from an eruption that is estimated to have occurred about 600 years ago. Now the remaining crater lays filled with water, transformed as a deep crater lake. And it’s an awe-inspiring sight. Pictures don’t even really do it justice, as Quilotoa is simply one of those places that you have to see in person. It’s jaw-dropping gorgeous. There are some great views from the Quilotoa Crater rim, but it’s a fun hike down the steep path to the bottom. Along the way, there’s an awesome swing that flies over the edge of the crater. Amazing! Once at the bottom of Laguna Quilotoa, there’s a chance to kayak around the crater lake ($2.50). It’s then a tough hike back up to the top. For those that don’t quite have the energy, some men with some mules are happy to offer their services. 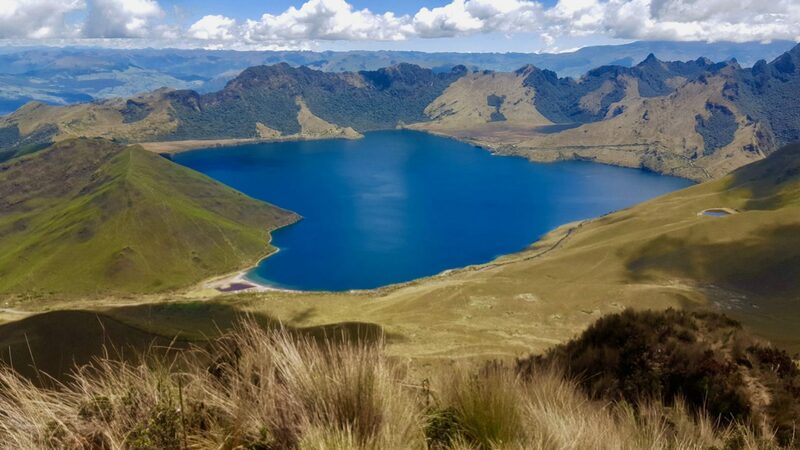 While going to Laguna Quilotoa does make a good day trip from Quito, it’s also possible to pursue a longer 3-day trek in this area known as the Quilotoa Loop. For more info on that, see our separate post: How To Trek the Quilotoa Loop the Cheap & Easy Way. 🚌 Quito to Quilotoa Bus: To travel from Quito to Quilotoa by bus is not recommended for a day trip. It’s suggested only pursuing this if staying in Quilotoa overnight. There are regular buses departing terminal Quitimbe in Quito to Latacunga (1 hour, $1.50). From there, less frequent buses travel onward from Latacunga to Quilotoa (2 hours). • Least expensive (Thurs only): At $45, this tour is the least expensive Quilotoa day tour we’ve seen. The Thursday-only tour also includes a stop at the base of Cotopaxi, among other places in route to Quilotoa. Check availability and book on GetYourGuide. • Good option (Thurs & Sun): This tour with Ecuatraveling is $50 and runs on Thursdays and Sundays. 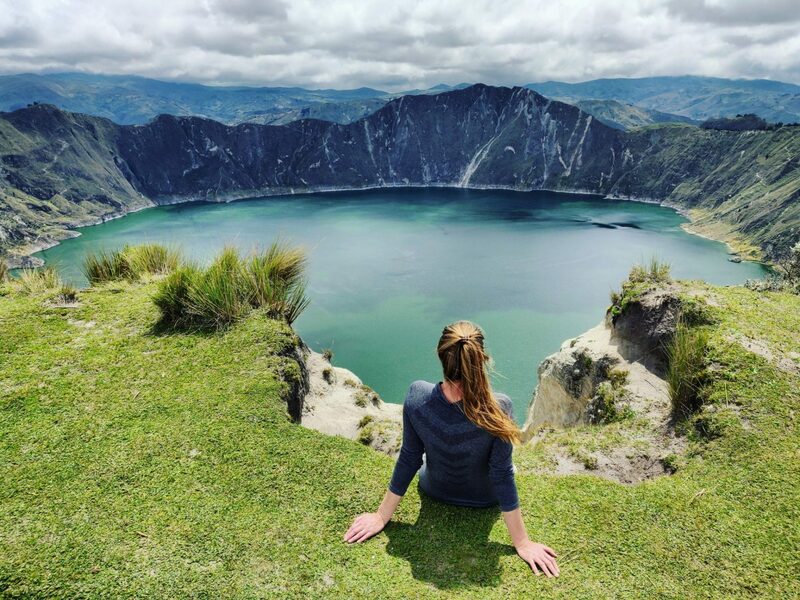 • For 3+ more people & flexible date: Carpe DM also runs a Quilotoa Crater Day tour for $50 when there are 3 or more people. Otavalo is home to Ecuador’s most famous local market, which is one of the largest and most renown markets in all of South America. We recommend an Otavalo day trip for anyone who enjoys shopping for local crafts, as you’ll find the best craft shopping in all of Ecuador here. 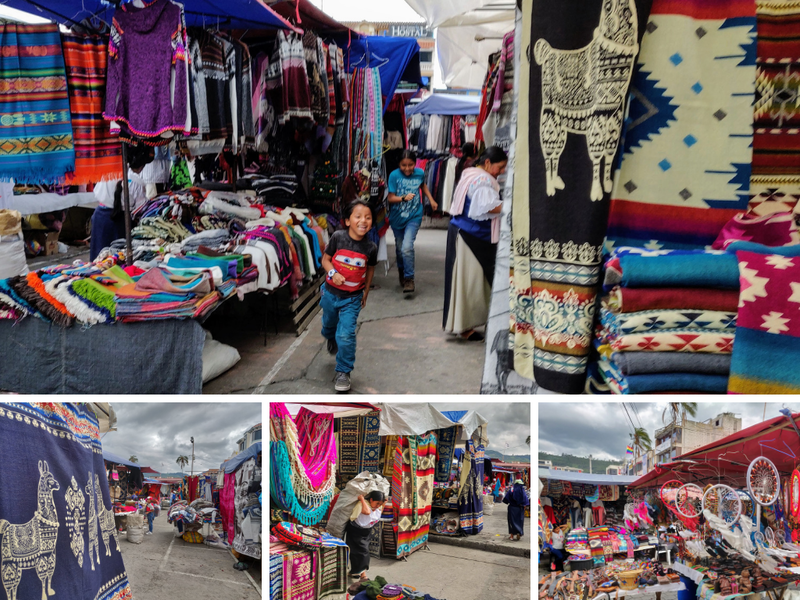 The Otavalo market tradition goes back hundreds of years all the way to pre-Incan times. The craft market is a particular highlight with so many colorful items on display. This famous Otavalo market really expands on Saturdays, and to a lesser extend Wednesdays. On Saturday the market sprawls out across dozens of blocks of Otavalo’s streets. The market runs from 8:00 am to 6:00 pm, although we notice people begin to start packing up after 4:00 pm. While Saturday and Wednesday are best, it is possible to visit the craft market any day of the week. On Saturdays, there’s also an animal market that may seem like a novelty, but we suggest passing on that. There’s really not much to it, other than disturbing animal conditions. Other things to do in Otavalo: There’s an impressive condor rehabilitation center, Parque Condor, which can be reached by taxi from Otavalo for $4. Near there is a beautiful waterfall, Waterfall Peguche, accessible by a short hike. Also nearby are some stunning Andean lakes, such as Laguna Cuicocha and Lagunas de Mojanda. More on the latter in the next section. 🚌 Quito to Otavalo Bus: It’s fairly simple to take the Quito to Otavalo bus. First, go to Terminal Carcelén. Use taxi/Uber ($5-$8). Or take the Trole line to the most Northern stop, where a transfer bus continues the remainder of the way to Carcelén. From Carcelén, a Quito to Otavalo bus departs nearly every five minutes between 4:40 am and 9:30 pm. It’s $2.50 and takes about 2 hours. 🚐 Otavalo Day Tour from Quito: It’s worth considering a day tour, not only out of convenience but because of the additional attractions they stop at along the way. Otavalo day tours also visit Cayambe for the opportunity to view the tallest point on earth crossed by the equator, visit Solar Clock Quitsato on the equator ($1 extra), and go to a bakery to try bizcochos, Cayambe’s famous pastry. Tours also visit San Pablo Lake viewpoint, Peguche Waterfall, and Laguna Cuicocha crater lake. So there is a lot more to see than just a craft market! • Ecuatravel offers this tour for $50. It’s on Wednesdays and Sundays only, when the market is biggest. For the convenience of reserving this tour in advance and booking online with just a few clicks, you can book it on Viator for slightly more. This area just outside of Otavalo is a hiker’s paradise on a clear day. What looks like picturesque green foothills are actually high-altitude alpine volcanoes! In between them, scenic crater lakes abound. It can be a magical place to visit when the weather cooperates. There are dozens of treks to pursue at Lagunas de Mojanda, but the summit of Fuya Fuya is the most popular. It’s a great (and steep) hike to the summit of Fuya Fuya (4,263 meters) that offers some specular views of the lakes below and the many volcanoes that surround. 💡 Pro tip: pack some cardboard to slide down this volcano on the descent! While it may be among the most beautiful places in the region, it does take a bit more effort to reach from Quito. And no organized day tours go to Lagunas de Mojanda. 🚌 Quito to Lagunas de Mojanda bus + taxi: It’s not possible to get all the way Lagunas de Mojanda by bus. It can be accessed from Otavalo (see bus directions in section above). From Otavalo, it’s a $15 taxi to Lagunas de Mojanda, each way. Consider paying the taxi to wait or to return (particularly so on a weekday), as taxis are not frequent here. 🏨 Otavalo & Lagunas de Mojanda Overnight: While possible as a rushed day trip with an early departure, a better plan is to stay overnight. We recommend a stay at Lodge La Luna (see picture above). There are many great hikes directly from Lodge La Luna, like the short but great trek to a nearby Taxopamba Waterfall. From La Luna, Lagunas de Mojanda is a 2-hour walk or $12 taxi away. The onsite restaurant run by the friendly owners has delicious fairly priced meals and even serves local craft beer from Otavalo (La Fortaleza, $3.50). Lodge La Luna is very popular and often books full, so check La Luna availability on Booking, and don’t hesitate to reserve a room! Before pursuing all the fun things to do in Quito, there are other logistics and travel tips to be aware of. 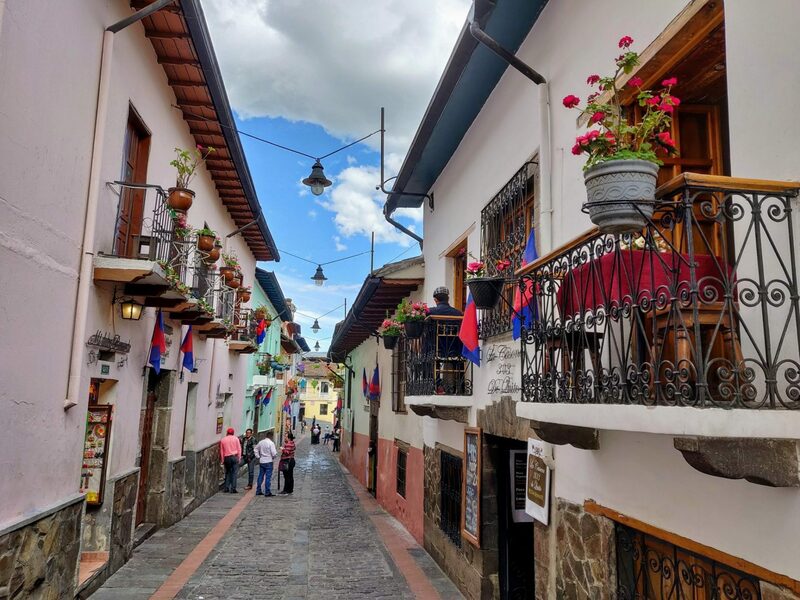 We’ve scouted out the cheapest flights to get to Quito, the best places to stay in Quito, and important travel tips you need to know. 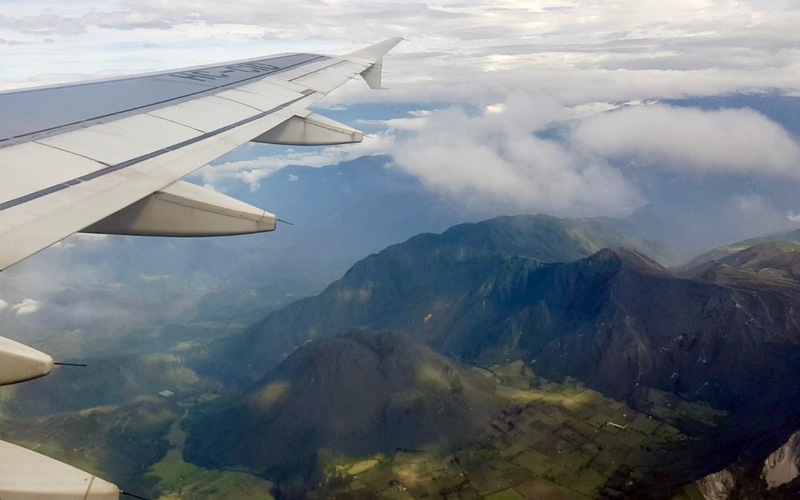 The best-priced airfares from the US to Quito can be found departing from Florida. Orlando, Fort Lauderdale, and Miami all have fares to Quito under $250 each way, if you book at the right time. Try to book at least three weeks in advance. There’s a nonstop JetBlue flight from Fort Lauderdale to Quito that we’ve even seen priced less than $100 each way! Other flights from many airports in the US to Quito can cost upwards of $1,000, so it’s worth considering booking a separate flight to Florida first in order to save several hundred dollars in airfare. New York City also tends to have competitive rates to Quito, although usually a layover is involved. We’ve found the best rates to Quito by searching Skyscanner. The cheap ticket from Europe to Quito is likely through Spain. Iberia is the only airline with a direct flight from Europe. The flights from Madrid usually cost around $550 each way, although we’ve seen it as low as $300-$400! In July 2019 Plus Ultra will begin operating competing flights from Madrid to Quito and could perhaps spark a pricing war, which could lower prices even further. Meanwhile, Air France will begin direct service in May 2019 from Paris to Quito, but prices are high. Elsewhere in Europe, you may be spending well upwards of $1,500 on a round-trip ticket to Quito, so it may be worth popping over to Madrid to catch a cheaper Iberia or Plus Ultra flight for the cost savings. Again, we’ve found the best rates from Europe to Quito by searching Skyscanner. So which should you choose? It’s a tough call, but we lean more towards recommending a stay in Old Town, particularly so for shorter stays. In Old Town, you’ll be right in the heart Quito’s historic center to more easily experience some of the capital’s cultural highlights. Yet for those who are in Quito for a longer stay, New Town may prove a better option. It enjoys a location with more modern conveniences. There are lots of restaurants, malls, supermarkets, and bars. There’s also more of a nightlife scene around Plaza Foch compared to Old Town, so those looking to party may also be better situated in New Town. And it can be a bit safer at night. Either way, it really doesn’t make too much of a difference, as these two locations are only separated by a few stops on the Ecovia or a $2-$3 Uber/taxi. 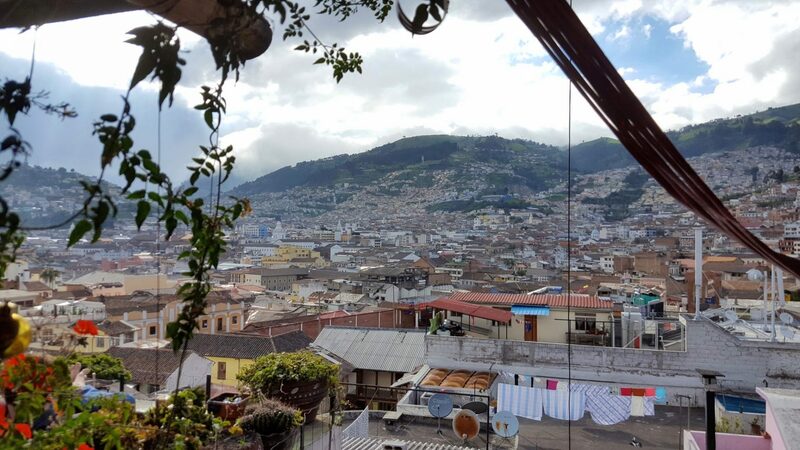 🏨Best in Old Town: The Community Hostel: This Quito favorite has a great location right in the heart of the Old Town, wedged between Mercado Central (with great inexpensive local meals) and Bandido Brewing. Conveniently, this hostel also runs the free walking tour and offers many inexpensive tours all throughout Quito. Excellent helpful staff and dorm beds start at only $10! Enter your dates here to check Community Hostel rates & availability on HostelWorld. 🏨 Highest Reviews: Hostel Revolution is a good choice for those who can’t decide whether to stay in Old Town and New Town, as it’s kinda right between the two. This hostel boasts some of the highest reviews on HostelWorld. 🏨 Best in New Town: Color House: For those wanting to stay in Quito New Town on a budget, this cheap and cheerful hostel may be the best option in the area. It’s only one block away from all the fun of Plaza Foch. And the $7 dorm beds even include breakfast! 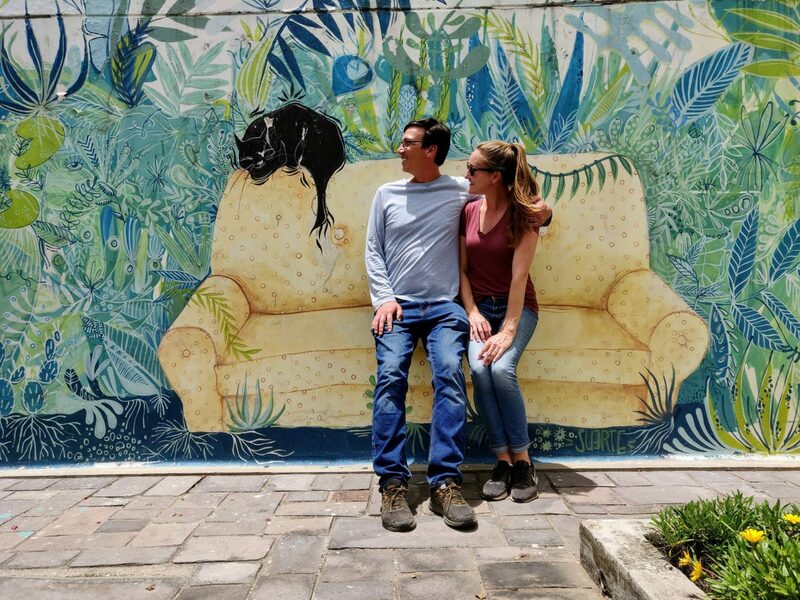 🏨 Best for Day Trips & Sweet Views: The Secret Garden: This is another popular hostel in Quito Old Town with a consistent track record of reviews. It’s also home to the Carpe DM tour agency, which makes for added convenience for early morning excursions and to have a pulse on when day trips occurring. Yet perhaps its best feature is the hostel’s namesake rooftop bar with sweeping views of Quito – take a look at the pic below! Secret Garden dorm beds start at $10. You can actually find some very decent private rooms in Quito for under $20 per night! They may be fairly basic, but they’re clean & comfy crash pads. We scoped out a few places, and our recommendations are below. Clicking on the links take you to the respective hotel’s page on hotelscombined.com which conveniently searches all the major booking sites (Booking.com, Expedia, Priceline, etc.) to find you the site offering the lowest rate. 🏨 Hotel Yumbo Imperial: You can’t beat the location, smack in the middle of the historic center just two blocks form Plaza Grande. Hotel Yumbo boasts small but colorful rooms, at an incredible bargain, with a great location. 🏨 Hotel Margarita 2: This hotel has very nice rooms for under $20 price. Thus, it may be one of the best values in Quito that includes private bathrooms (rather than shared). It’s next to a park and only about a 10-minute walk to the historic center. 🏨 L’Auberge Inn: While not located in Mariscal nor in the historic center, the hotel’s location in between the two, making either area accessible. With great reviews and a great value, this is certainly a place to consider staying in Quito. 🏨 Embassy Quito: This must be the most modern and stylish hotel you can find in Quito for under $50 and includes breakfast. 🏨Sierra Madre: This is another great option near Plaza Foch, with breakfast, and rooms under $50 per night. For a little luxury, Quito has some fantastic value 5-star hotels to consider. Each of these can be booked for around $100 per night, which is a steal for the high-quality accommodation they deliver. Even if it’s out of your price range, just take a look at some of these elegant properties in Quito. 🏨Casa San Marcos Hotel Boutique: If looking for a classy place in Quito Old Town that retains the area’s historic charm, look no further. This boutique hotel offers all the modern conveniences amongst gorgeous antiques and old world charm. This intimate space boasts an excellent location in Old Town. If we were to splurge in Quito, this would be our #1 choice. 🏨 GHL Hotel Le Parc: Add some elegance to your stay in Quito with this swanky hotel in the financial district right next to Parque Carolina. 🏨NH Collection Royal Quito: This modern hotel is all class in the trendy La Floresta neighborhood. Whenever we stay somewhere for longer periods of time, we always prefer to rent an apartment or house through Airbnb to have the conveniences of a kitchen, laundry, etc. 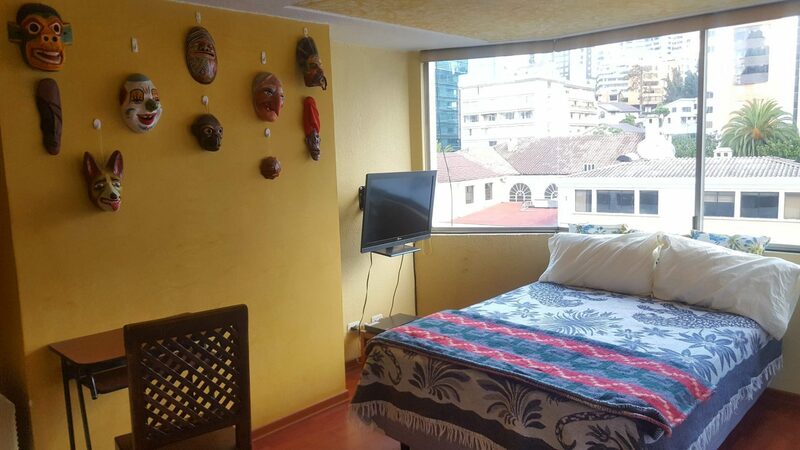 In Quito, we found modern one-bedroom furnished apartments as low as $400 for the month (28 days) including utilities. Of course, shorter stays are possible too, but quick stays may be better served by a hotel or hostel, which are similarly inexpensive throughout Quito. If interested in Airbnb and have never used it before, feel free to use our referral link to save up to $40+ on your first Airbnb booking. 🌩️ Don’t check the weather. Seriously, don’t bother. It’s always wrong. The weather in Quito is very unpredictable. While the predicted temperatures can be somewhat trusted, we’ve never witnessed the sun/cloud/rain forecasts to be so consistently wrong anywhere in the world as it is in Quito. ☔ Always bring a rain jacket. Or a compact travel umbrella like this. Weather changes in an instant in Quito. A beautiful sunny day can turn into a torrential downpour with almost no transition. Always take a rain jacket or umbrella with you even if it appears to be a bright sunshiny day. June through August are the driest months in Quito, but it still rains then too. 🍽️ Get to know the “almuerzos.” The Spanish word for lunch is almuerzo. But in Quito, it takes on a slightly different meaning, as restaurants offering almuerzos are generally dishing out a set 3-course set menu of soup, a main w/ sides, dessert, and juice. Almuerzo prices typically range $2.00-$3.50. The incredible values are very common all over Quito. Look for the sandwich boards or a handwritten sign. ☀️ Use lots of sunscreen. In Quito you have the double-whammy of the equatorial sun and altitude. The sun in Quito is no joke and we managed to get burned even on cloudy days. Pack sunscreen with you. It tends to be much more expensive in Quito compared to US prices. Use at least SPF 50. We like this Banana Boat sunscreen that Amazon sells at a good price. ⛰️ Beware of the altitude. 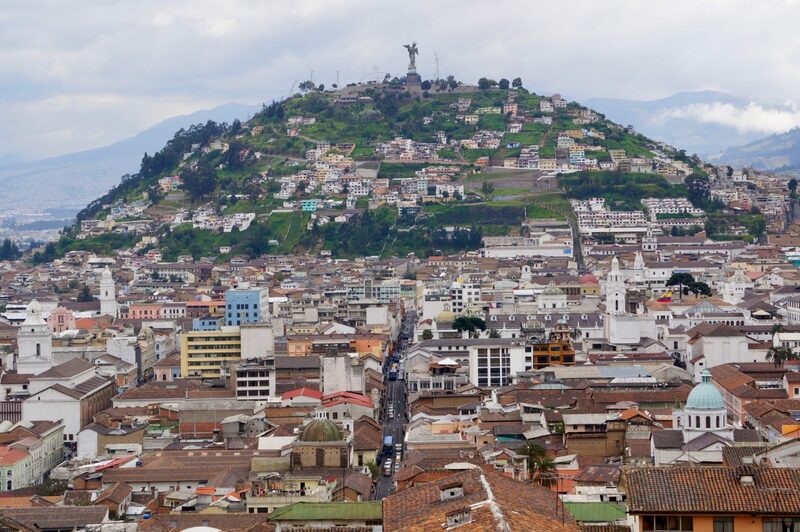 Quito is one of the highest capital cities in the world, with an altitude of 3,000 meters (that’s about two miles high)! Some people visiting Quito from sea level experience symptoms of altitude sickness. Allow a few days to acclimatize before pursuing physical activities like hiking Cotopaxi and Quilotoa. For those particularly prone to altitude sickness, consider taking this natural medication. It’s well worth it, as evidence from these great reviews it gets on Amazon. Avoid that throbbing headache and instead enjoy your trip to Quito! 🚰 Don’t drink the water. The tap water in Quito is generally not safe to drink. Use bottled water only. Also, consider traveling with this compact LifeStraw. We have one and it really came in handy a few times when we realized we were out of bottled water at night, after all the stores were closed. 💸 Cash is king. Ecuador uses the US dollar as its currency. While some places in Quito do accept credit card, most don’t. Some places that do take plastic may add a fee. ATMs are frequent, so it’s best to use those and have cash. 💵 Use small bills. Most businesses generally don’t accept $50 or $100 bills. Come with small change as you’ll otherwise have a very difficult time breaking a hundo spot. Even twenties can sometimes be tough to break. Carry small change if possible. 🆔 Carry your ID. It’s not only the law. Bars often ask to see your ID upon entry (even when you’re clearly of age) and it is almost always required if you do make any credit card purchases. 🚇 Avoid public transportation for short trips. We’re usually advocates of public transportation as a cost-effective means of transport. But in Quito we found Uber & taxi rates to be very reasonable (a few kilometers across town is typically less than $2). Meanwhile, the $0.25 Ecovia, Troles, and buses are often completely packed to the point that you can barely breathe with all the people up against you. It’s definitely worth it to spend a few extra quarters. 🚕 Use the meter for taxis in Quito. Often a taxi driver will turn on his meter upon you entering the cab. If he does, go with it. It’s a good rate. If not, be sure to negotiate a price immediately or you could end up paying more than expected. 🚗 Or use Uber in Quito. Better yet, use Uber. We found rates tend to be about the same, or slightly cheaper than a taxi. Uber is safe and reliable in Quito. It’s also a good option for non-Spanish speakers. Because the destination is input into the app, there’s no need to explain directions. As long as you have an international data connection, the same Uber app you use at home works in Quito. 👛 Watch out for pickpockets. Keep very vigilant, particularly in crowded places frequented by tourists. 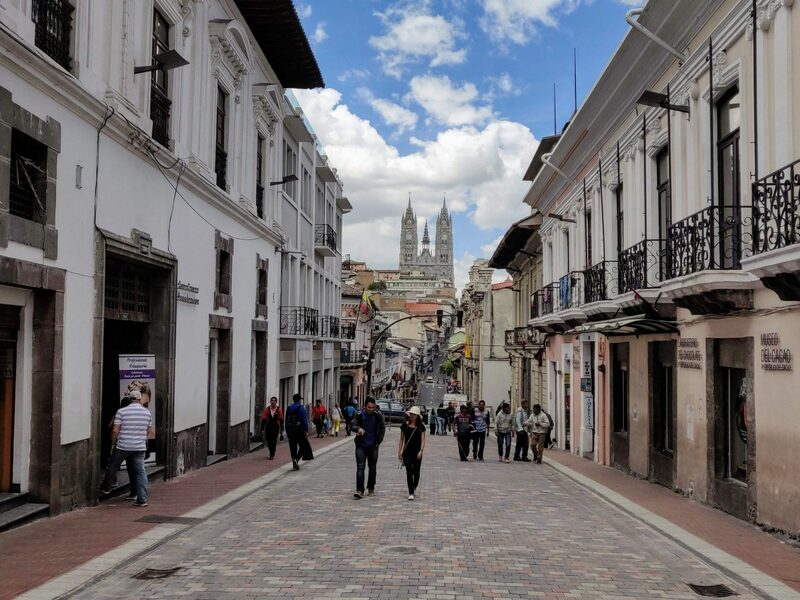 While we found Quito to be safe overall, we noticed that pickpockets seemed to be out in full force in touristic areas, particularly in Old Town and in crowded public transport. Be very mindful if someone seems to be innocently bumping into you. Keep belongings close. ⚠️ Important: Be Sure to Have Travel Insurance in Quito. You never know what could go wrong during a trip to Quito, from a minor incident like lost luggage or flight cancelation to a major disaster like an earthquake or a car accident, travel insurance will not only come to your rescue but will cover those unexpected costs. Whether you sprain an ankle while hiking Cotopaxi or become a pickpocketing victim in Plaza Grande, don’t let something like this ruin your trip to Quito. We always use travel insurance while roaming around Ecuador and recommend it. We like World Nomads, which has what we’ve found to have the best price and coverage combination (particularly for longer trips). Enter the dates for your tripto get a quick estimate. 💼 What to Pack for Quito: Pack for Quito as you would for any cool weather destination. We also recommend plenty of activewear and sun protection. Be sure to check out our Ultimate Travel Packing List for all our packing tips and travel gear ideas, which we wrote while based in Quito. We hope this Quito travel guide has helped to show what we’ve found are the best things to do in Quito. 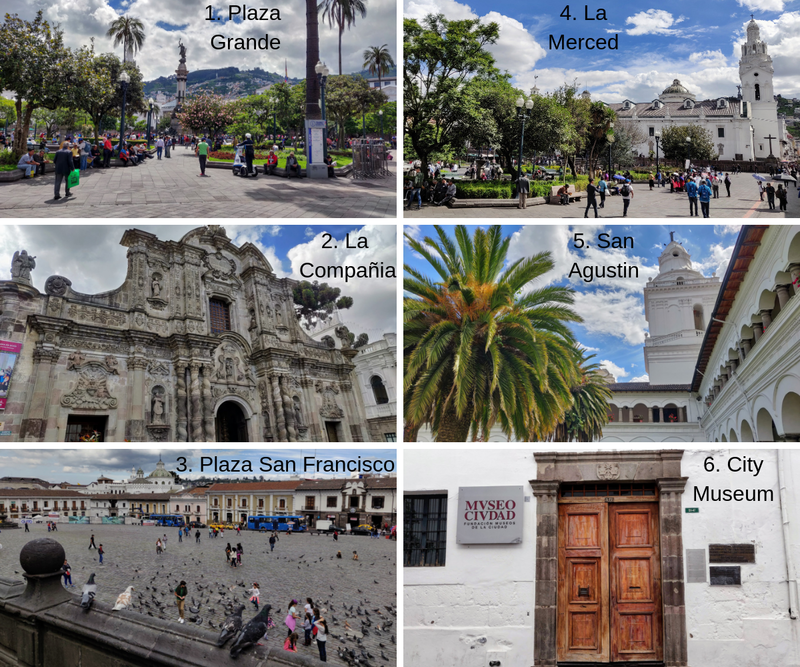 If you’ve used this guide to help plan a trip to Quito, please let us know in the comments. We always love to hear from people who may have stumbled across our posts. Or if you have any questions while planning a trip to Quito, feel free to ask and we’ll try to answer. Finally, if you’ve been to Quito and have your own favorite thing to do in Quito, let us know so we can check it out next time. And there will be a next time. We’ve already made two lengthy trips to Quito and I’m certain we’ll be back again. Quito is way too fun not to return! Lastly, if this post has helped you, please consider sticking with us to continue receiving travel tips and inspiration! Follow our Facebook and/or Instagram to get more awesome travel ideas into your feeds! If you found this Quito Travel Guide helpful, then you may be interested in other travel guides we’ve published about Ecuador. 🐢 Did you know that you don’t have to take a pricey Galapagos tour? You can actually visit the Galapagos independently for cheap! This post reveals exactly how it’s possible. ⛪ Cuenca is Ecuador’s colonial gem and is another one of the country’s Unesco World Heritage Sites. It’s nicknamed the Athens of Ecuador for its historic center and being a cultural hub. Yet adventure abounds in the Andes that surround and our latest guide spills all the details. 🎡 Guayaquil is Ecuador’s largest city and when comparing to Quito it’s so different. Guayaquil is near the coast with a warm and tropical vibe. There’s also lots to do in Guayaquil to consider a stopover of a few days. 🚣 We weren’t sure if it was possible to travel by boat from Ecuador to reach the Amazon River. So we set off on a rural adventure to find out. Read our tale of how that went. 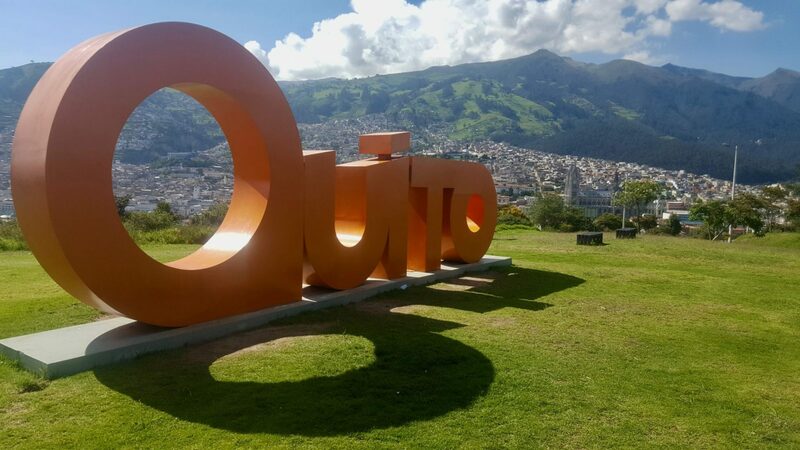 Publishing note: This article about the Best Things To Do in Quito was initially published in February 2017 and was edited + updated significantly on March 20, 2019, upon a return visit, to now reflect the latest and up-to-date info. Truly an amazing guide- muchísimas gracias!! I just arrived to Quito this morning and will be using this guide as a bible to all things cool in Quito! I’m definitely booking my hostel and Mitad del Mundo tour through your guide/site. Thanks again for such an easy and detailed guide!! Welcome to Quito! 🙂 It’s so great to hear this because we actually just spent the past few days giving this post a major update, after having just returned to Quito ourselves earlier this month. So it’s nice to know this fresh info is getting out there. Have an awesome trip to Quito and Ecuador! I’m so glad I found your post just before we went to Quito on March 3! I literally wrote down my list of things to do (and eat!) from this post, and everything was right on! Especially appreciated were the notes on taxi prices and approximate distances/drive times to sights. Thanks so much for all the time it took to put this together. So glad to hear this proved helpful! Thanks for taking the time to stop back by our blog to let us know. Always encouraging feedback to hear. 🙂 Hope you had a great time in Quito! Hi, Thanks for sharing such a comprehensive guide. Heading to Quito for a few days in coming months and this guide really helps us choose how to best spend that time. Any packing tips? –seems long pants and sleeves and a fleece would be wise…Cheers! De nada! 🙂 So glad to hear this has been helpful. In the last day or two, we actually just did a big major update to this guide for 2019. It’s largely the same recommendations, but some logistics had changed and a few new things in Quito we discovered had popped up. Regarding packing, yes definitely long pants and long sleeves. Some days it gets warm enough for short sleeves. But it tends to cool off quickly at night. Fleece would be ideal. No need for a thick winter jacket or anything. And be sure to pack stuff for the sun and the rain. Hope you have a great trip to Quito! I have literally refered back to this article throughout my entire 10 days in Quito. So helpful. Looking forward to the next one. Thanks for sharing. Ah, that’s so great to hear! 🙂 Thanks so much for dropping by with the comment to let us know. We’re really looking forward to returning Quito later this month! Cheers! Awesome post….you have tons of helpful tips, with specific details which most posts are missing. We are going to Quito in March for a week. This helps me feel more prepared. Thank you! Thanks for the kind feedback and so glad this proved helpful! 🙂 Hope you have a great trip to Quito! We’re getting excited to be heading back there next month ourselves. This is a really awesome guide. Thank you for all of the work on this! That i call a Guide – amazing work! Great suggestions! I have some notes I will post about somethings that have changed in the past 12 months, just finished a great visit with my husband. Wow – this is an awesome itenery. I plan on my first travelling experience and start in Quito. There seems so much to do i might plan in a few extra days! Onto the galapagos islands blog next! Thanks Abby! There’s so much to do in Quito, I’m sure you’ll be happy if you build in a few extra days. Enjoy exploring Ecuador, you’ve picked an excellent country to kick off your travels! I agree with all the previous compliments on how great this article is! I have a quick question. Where did you stay the night for the 2 day trip to Mindo? I would love to do the 2 day trip exactly how you suggest in the article. Always glad to hear this is helpful! 🙂 We stayed at Bio Hostal Mindo Cloud Forest. I was very inexpensive, good enough (yet nothing amazing), good location, and had a great hot breakfast. We were satisfied but really, there are loads of great inexpensive places in Mindo! Have a great trip – buen viaje! So glad to hear this Quito travel guide is proving helpful! Thanks so much for stopping by with the positive feedback. Hi John! Wow, this is a really comprehensive post with lots of really useful information and tips. It makes me want to go back to Quito. It’s such a beautiful city. I loved the Quito Craft Beer Tour. It was really fun! I actually just wrote a blog post recently too about alternative things to do in Quito. I would suggest doing one of the Escape Rooms in Quito. The games are quite cheep in comparison to the US or other parts of the world and some of them are well themed and thoughtfull. I would recommend Escape 23 in the Mariscal Area. Some more are: Exit, Room Escape Ecuador and Reto Eureka. We’ve seen those escape rooms popping up all over the place and have always wanted to do it. With costs lower in Quito compared to other places in the world, sounds like it could be worth doing there. Definitely something to consider checking out – thanks for the idea! Hey! What a winderdul article so helpful thank you very much for your work and passion. Quick questioni eant to do otovalo tour tomorrow but i want to take my time and buy a lot of souvenirs… do you think it is a great idea to do it with a grouo or it s best on my own??? Hey Esther, thanks for the comment! We’re so happy to hear that you have found our guide to be useful when planning your trip. Enjoy beautiful Quito! Wow, that’s a very nice and comprehensive guide to Quito! I’m planning to visit Ecuador this year, so definitely bookmarking it. Hey Pedro, thanks for the comment. We have no doubt that you’ll enjoy Ecuador just as much as we are! Quito Ecuador is really pretty. You are really lucky! I really want to visit here now. Hey Karla, thanks for the comment. We feel very lucky to travel through such a beautiful country 🙂 Hoping that you’ll get to experience it too! Excellent comprehensive article. I’ll be forwarding it to others bookmarking for myself. Thank you. Hey Alicia, thanks for the comment. We’re thrilled to hear that you enjoyed the article and thank you for sharing! We stayed the night at Casa San Marcos, and it was fabulous! 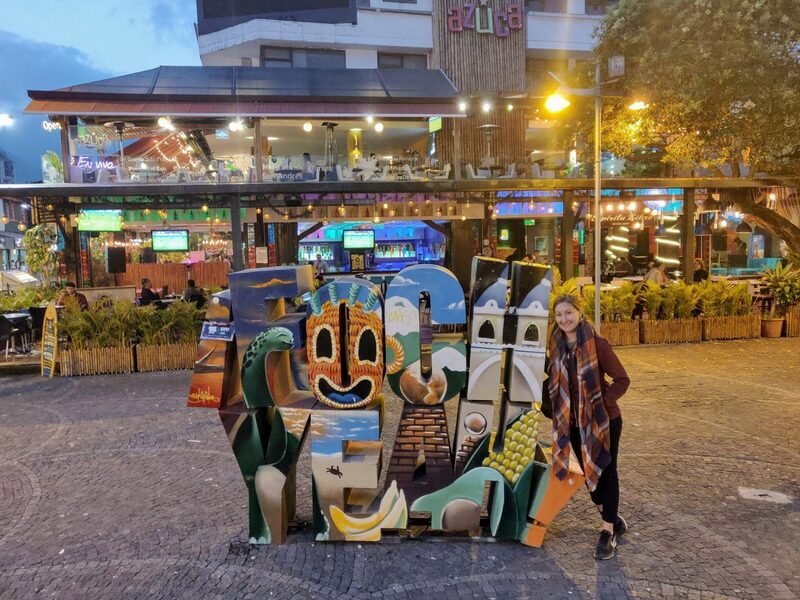 We were only really in Quito for a day and a half (we went to Canar, Banos, and Otavalo) and it was very rainy, but the Centro Historico was beautiful! Thanks for the comment! We have no doubt that you’ll have a wonderful time in Quito. Please let us know if you have any questions when planning your visit. Wow this is SUCH comprehensive guide to Quito. I have heard great things about this city, but I can see there is even more to do than I had heard of. Fabulous write up. First of all kudos for writing such an extensive and detailed article. Most people are busy writing listicles and this is a perfect mixture of story telling and point wise details to help travelers. Ecuador and the neighboring countries is, for me, a completely different world that I am always fascinated with but never had the opportunity to explore. There’s obviously so much to do here and the architecture and the vibe seems to be very European. I love how you gave such a well rounded posts covering all aspects of the city and the country to an extent. Reading the article my feet are itchy to really get up and start exploring again. Hey, thank you so much for the compliment! As you can see, we think that Quito and the surrounding area is a perfect travel destination with endless activities to keep one busy. Glad to hear that you’re considering exploring again. Please let us know if you add Quito to your itinerary and we’ll be happy to answer any questions. Best travel article ever! I am curious if you know the scoop on easy to reach waterfalls or swimming holes? I know there are waterfalls in the mountains but are there any other spots? Leaving June 29th til July 2nd from Miami, I’ve gotta take a dip or dive there! Thank you for sharing your experience in such a remarkable way! Oh you’re making us blush. Thanks! 🙂 As for waterfalls, if you are planning to go to Mindo (and you should! ), there are many many waterfalls all around there. Otovalo has some nice Falls around it too, such a Peguche. Closer to Quito, you could perhaps try the Rio Pita Waterfall that is about 1-hour South of the city and there are some excursions that go there, but it’s not a very common one. Hope that helps and have an awesome trip to Quito!! Hey Nicky, thanks for the comment. So happy to hear that you’ll be traveling to Quito. There’s so much here to do, and as you mentioned, the craft beer crawl is reason alone to stay. Please let us know if you have any questions when planning your trip to Quito. WOW. This is such a detailed post! You bet that I’m bookmarking your post now! After all, I aim to visit this part of the world sometime soon this year. Hey Aileen, thanks for the comment! I’m confident that you won’t regret adding Quito to your travel itinerary this year. Please let us know if you have any questions when planning your trip. By far, the most comprehensive guide to Quite I’ve read. I feel like you provided more information and detail than Lonely Planet does! Very impressed! I had no idea there was so many interesting things to do in Quito, because like you mention, most people I know who have been tend to just do an overnight before moving on. Interesting that it has a fun beer culture too, which is something I certainly would like to dive into! Quito is such an amazing city with loads to keep one busy, definitely deserves more than just a stopover. I hope you have an opportunity to check out the craft beer scene! Hey Anna, thanks for the comment! Glad to hear that you’ve been to Quito and reading this post brought back some memories for you.